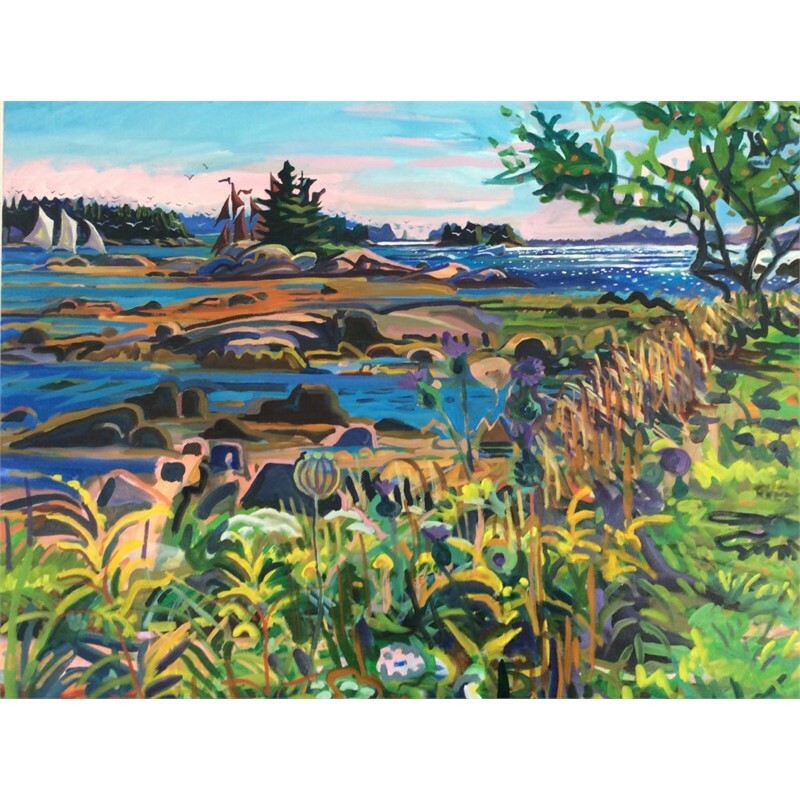 Jill Hoy earned a B.F.A. 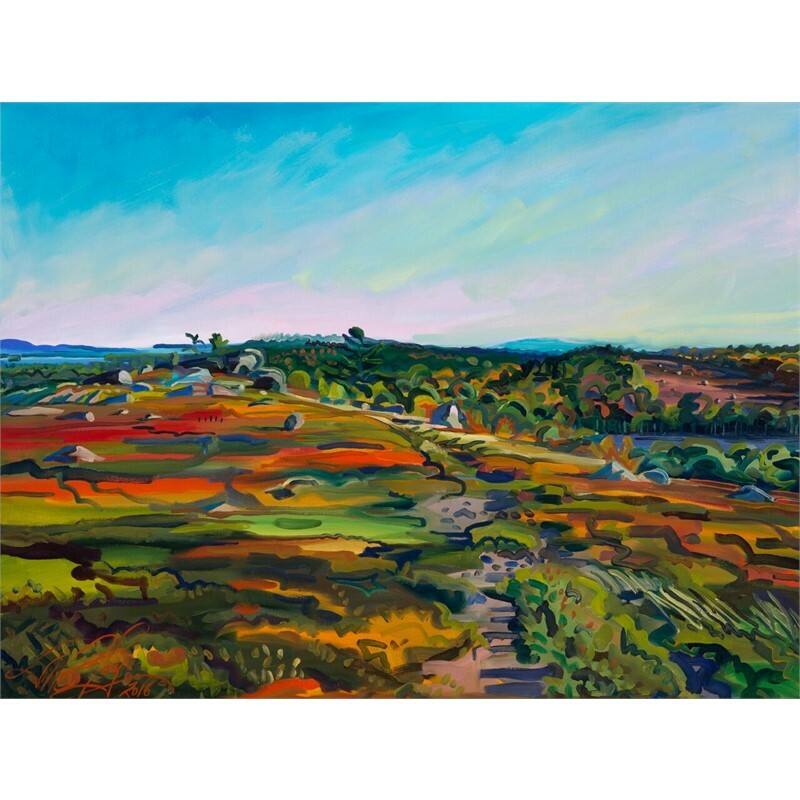 from the University of California at Santa Cruz and also attended the New York Academy of Art in New York City. 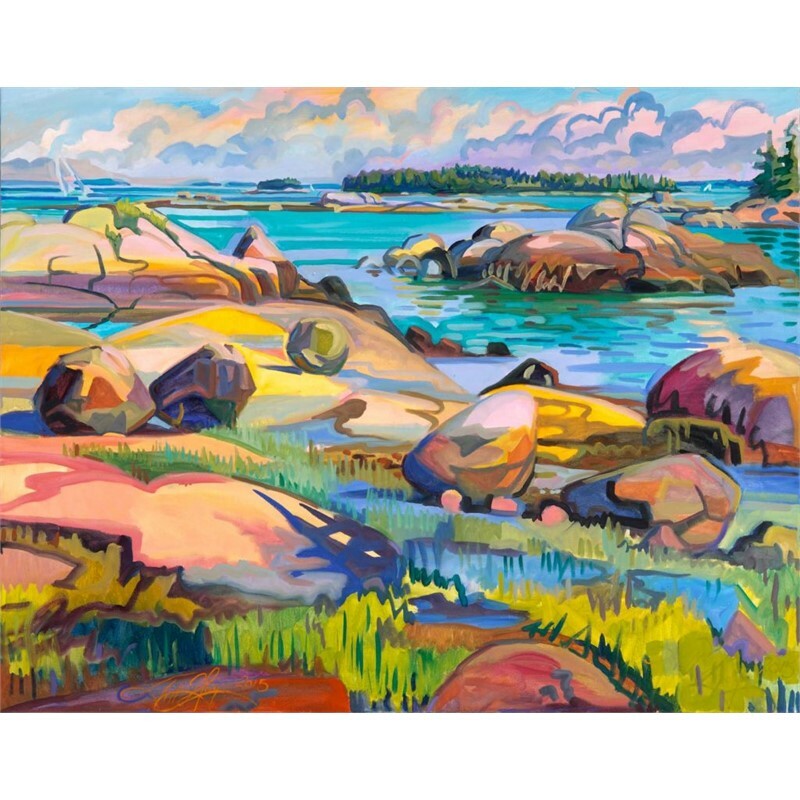 Her work has been included in numerous solo and group exhibitions around the country. 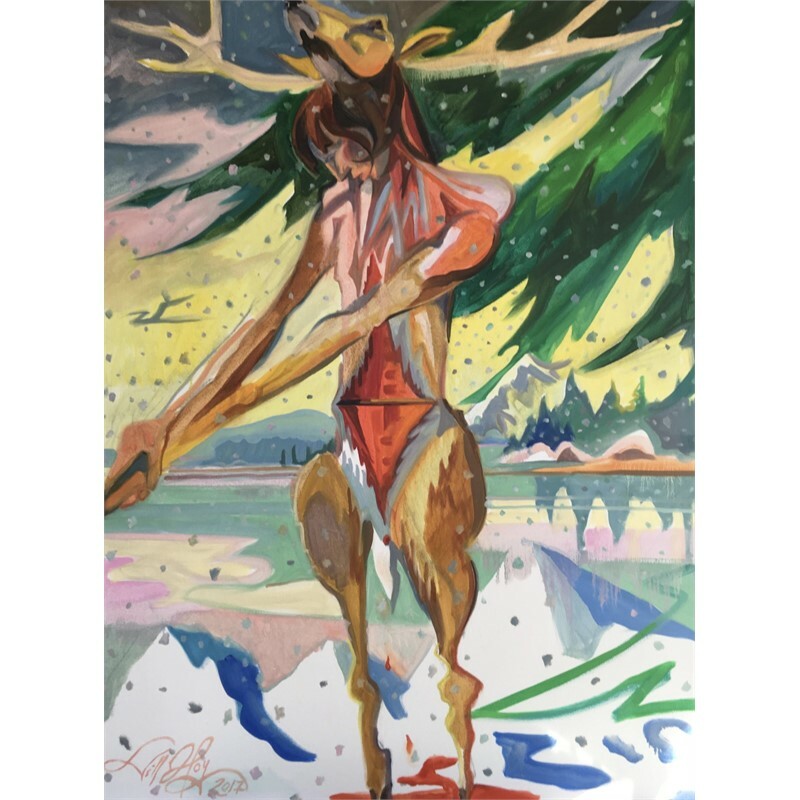 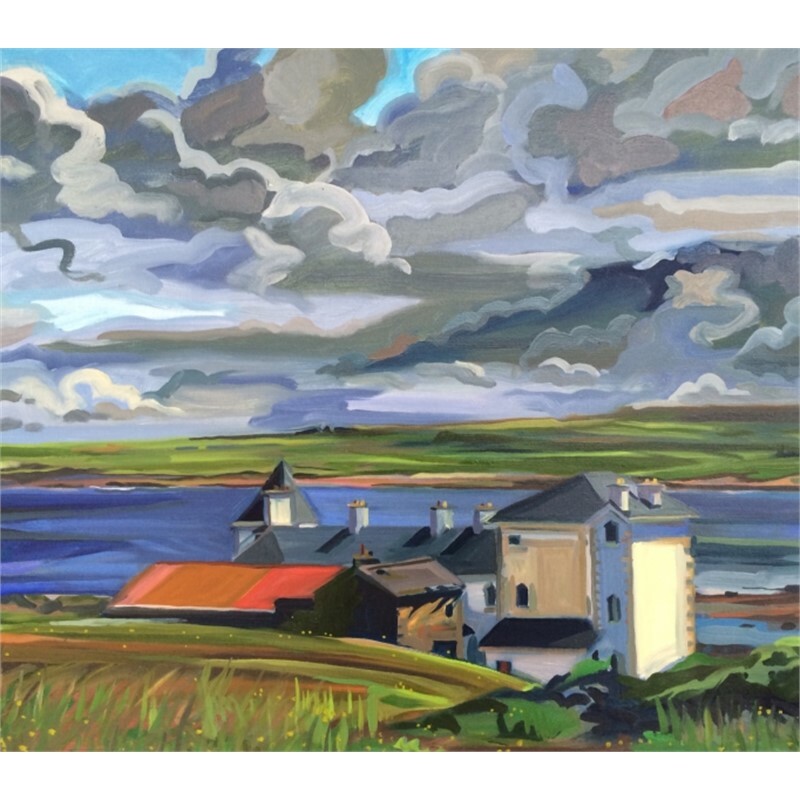 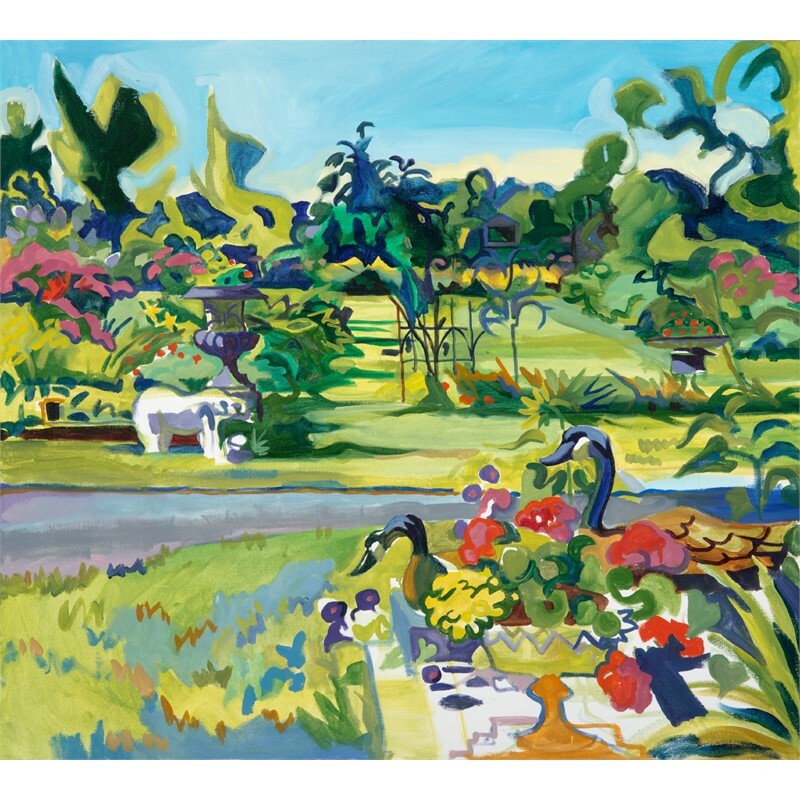 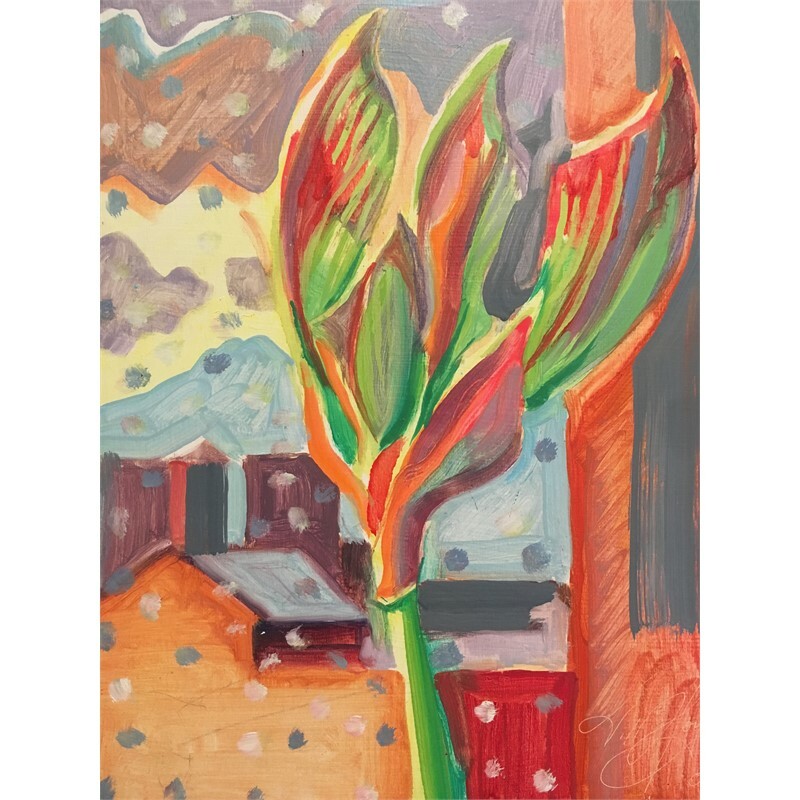 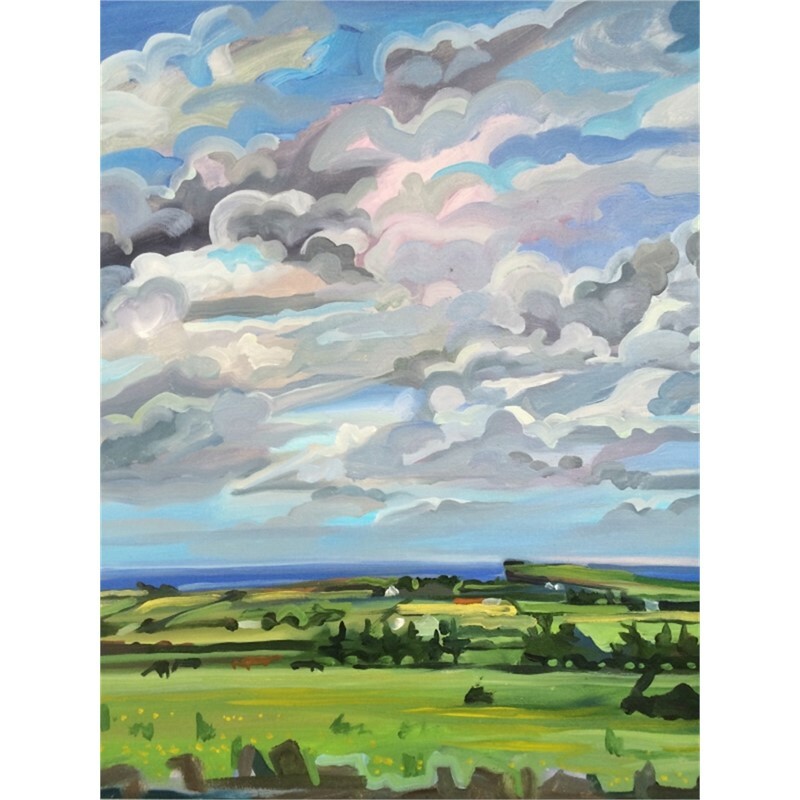 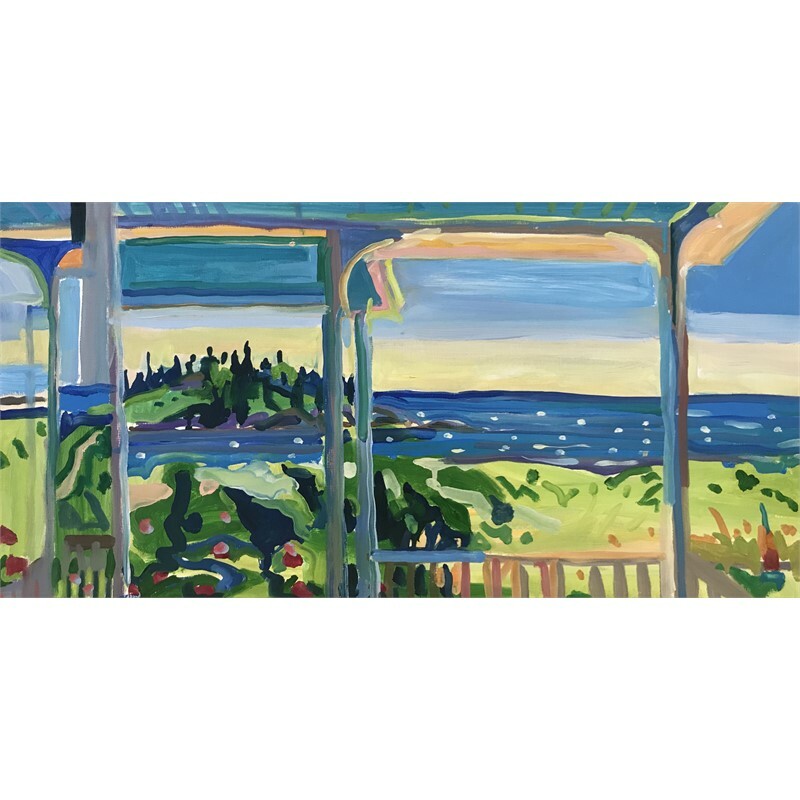 Jill creates two bodies of work, one which is figurative and created in her studio, reflecting her imagination; the other is a series of landscapes painted en plein air. 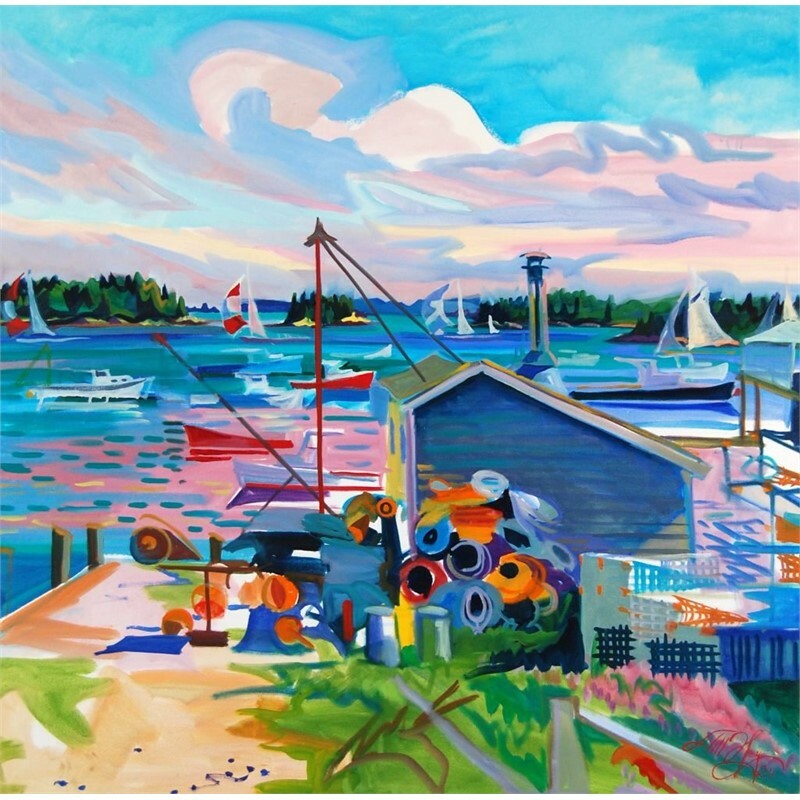 The artist divides her time among residences in Stonington, Maine, Somerville, Massachusetts, and New York City. 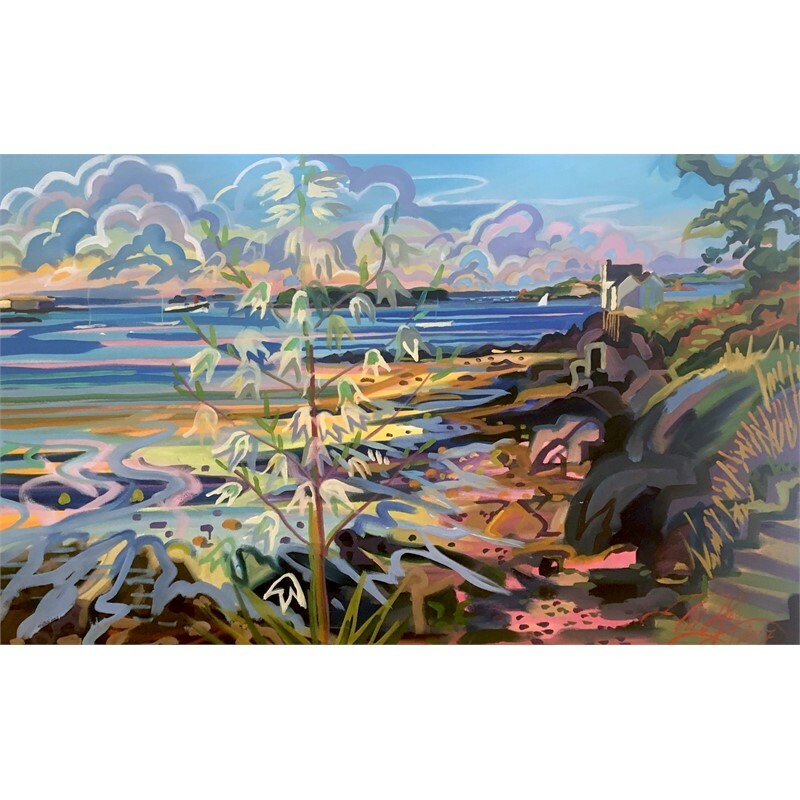 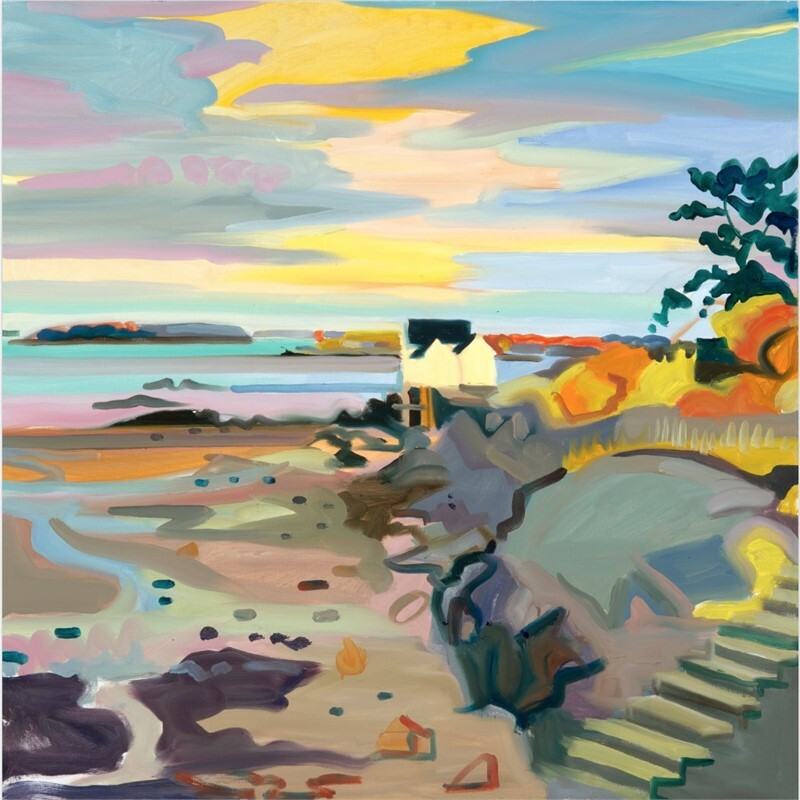 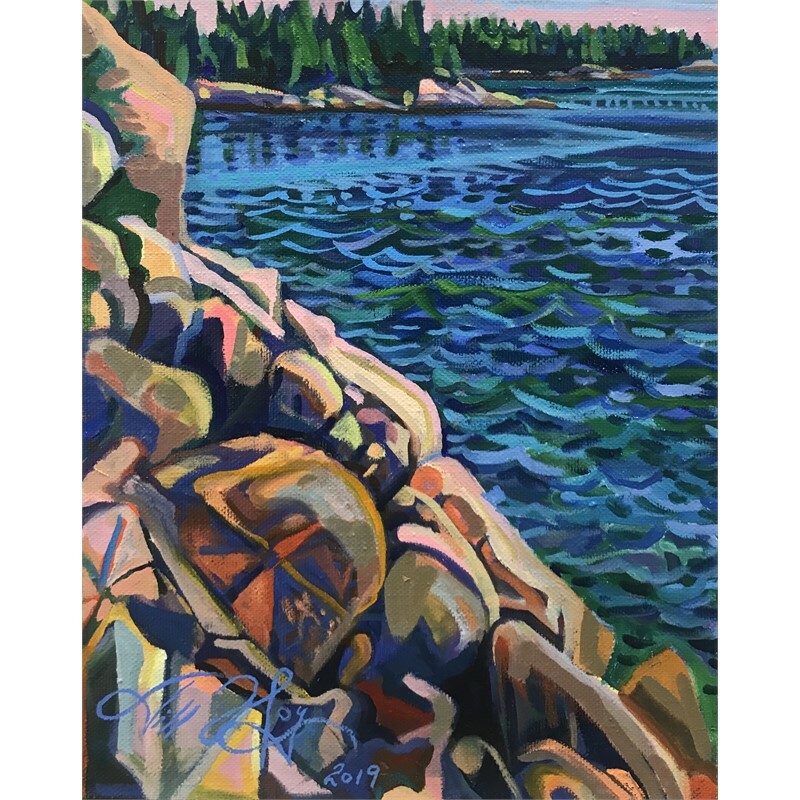 The work she creates in Maine is inspired by direct observation of the landscape and includes seascapes, architecture, and gardens. 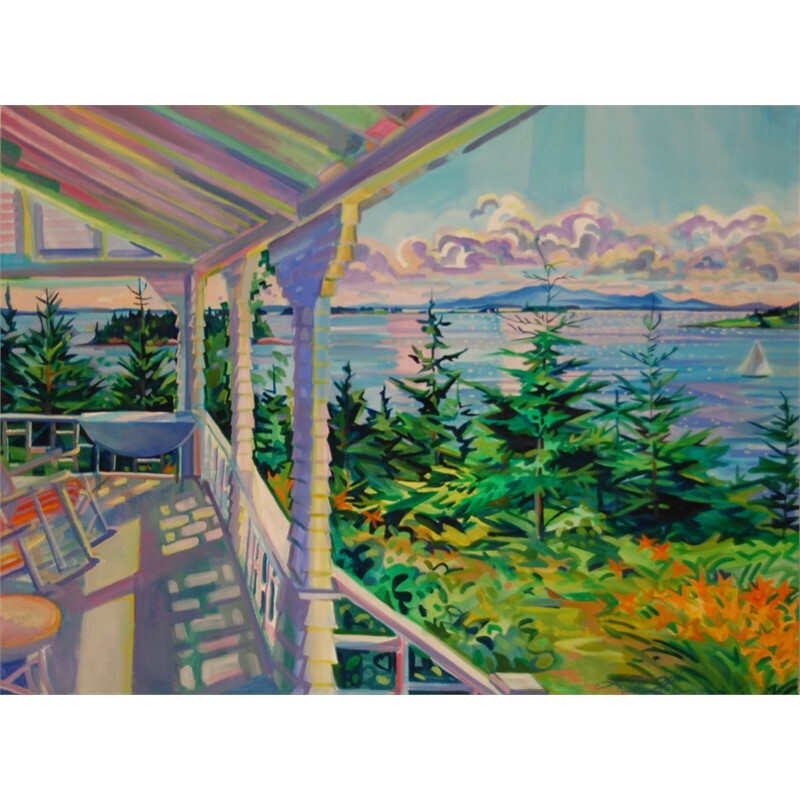 The artist, working on location, is especially interested in the effects of natural light, color, and pattern. 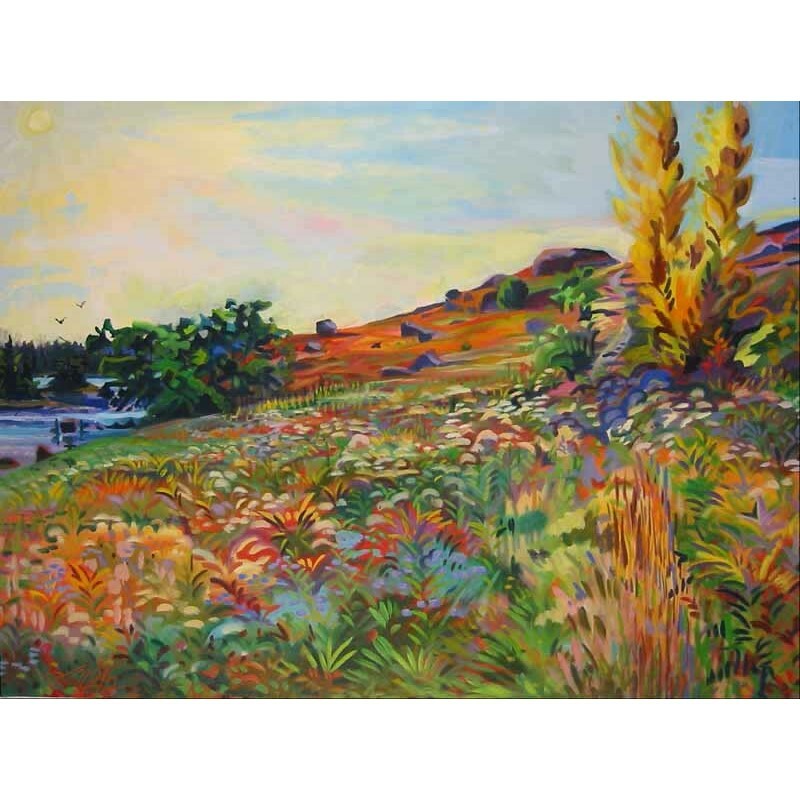 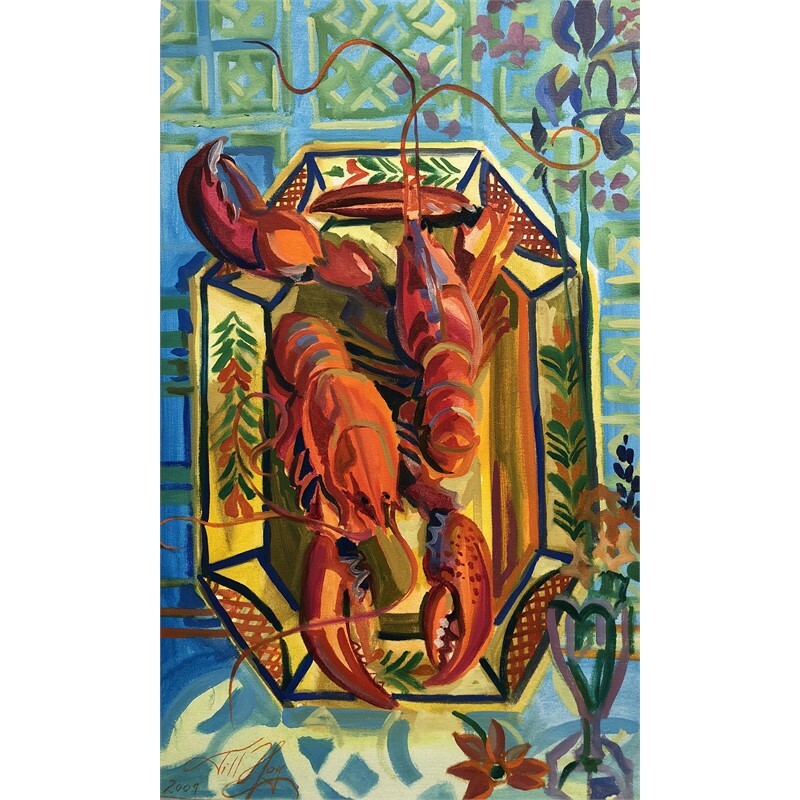 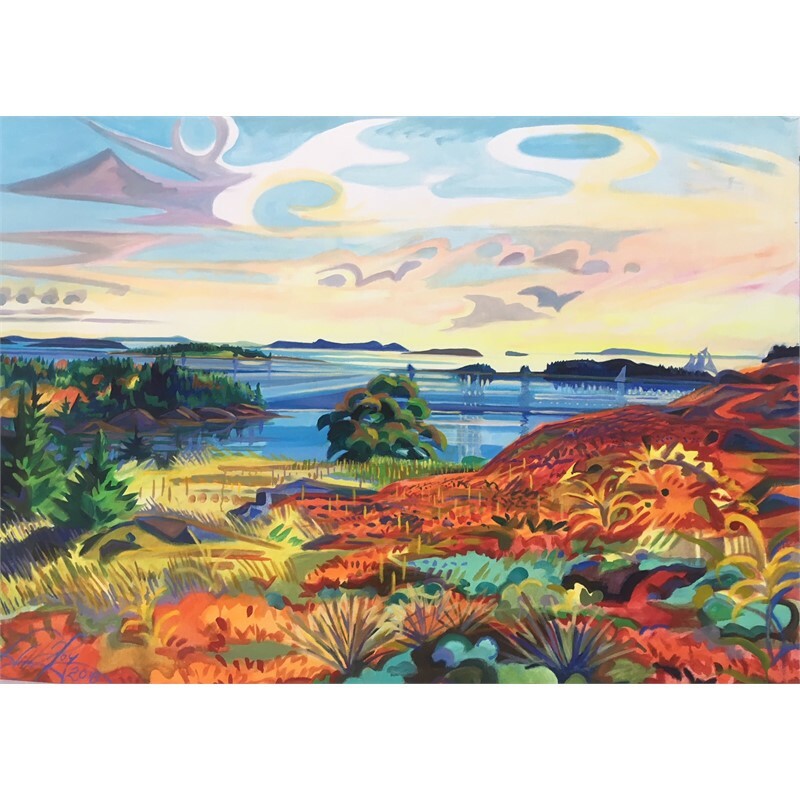 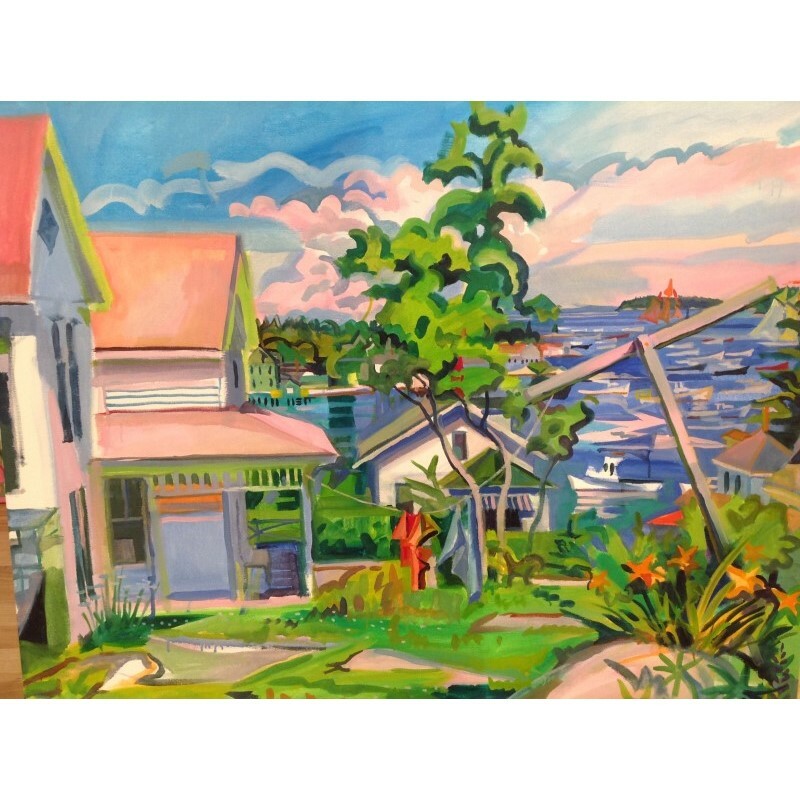 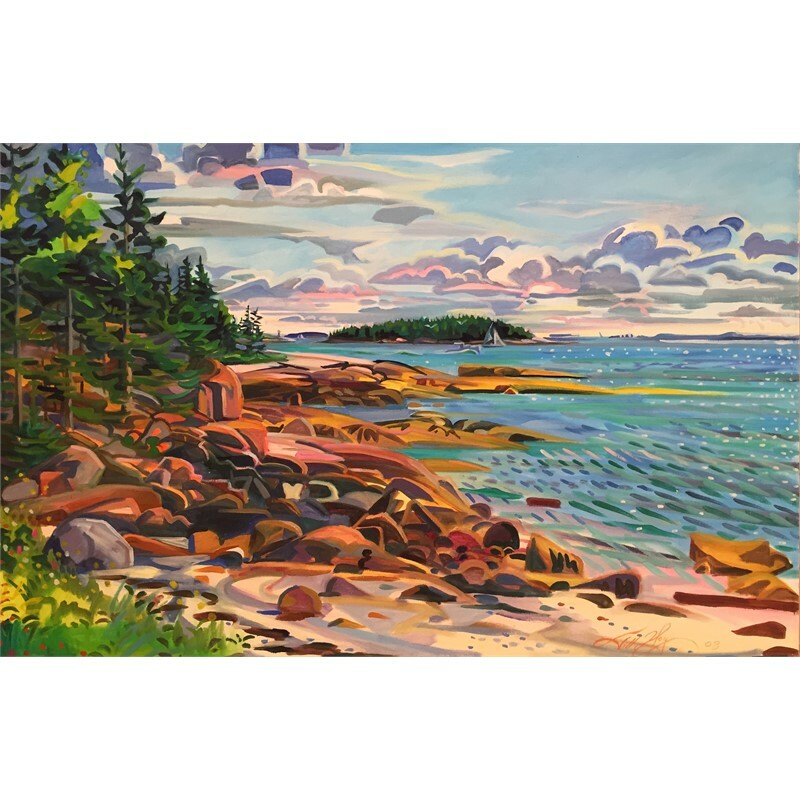 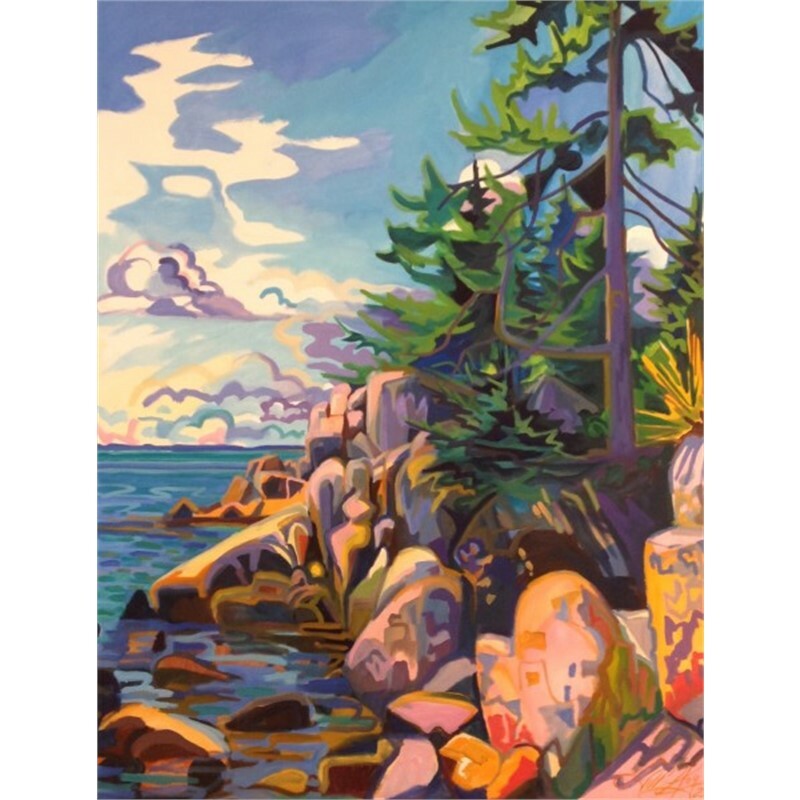 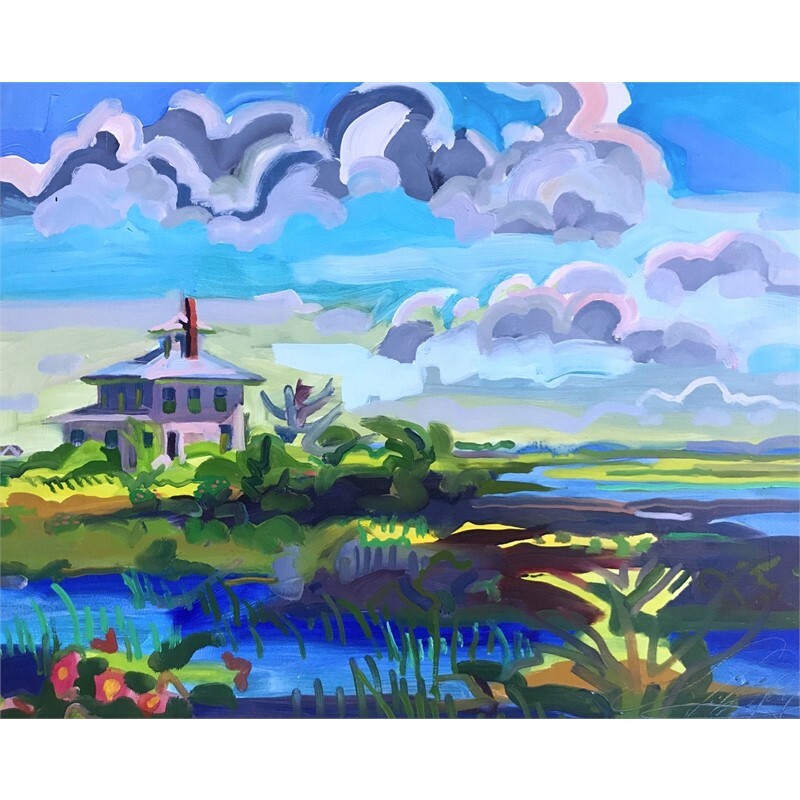 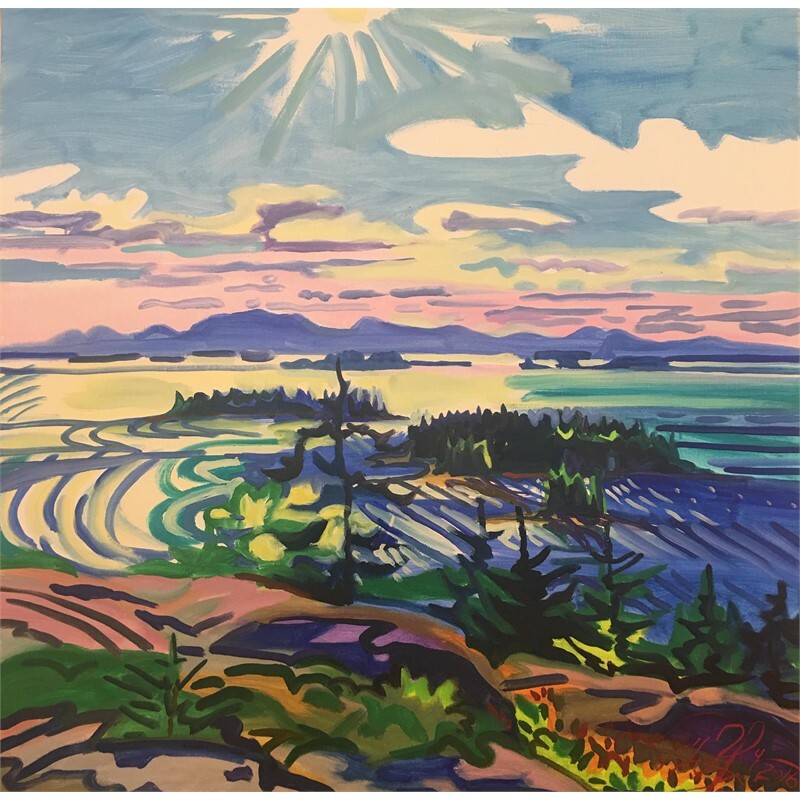 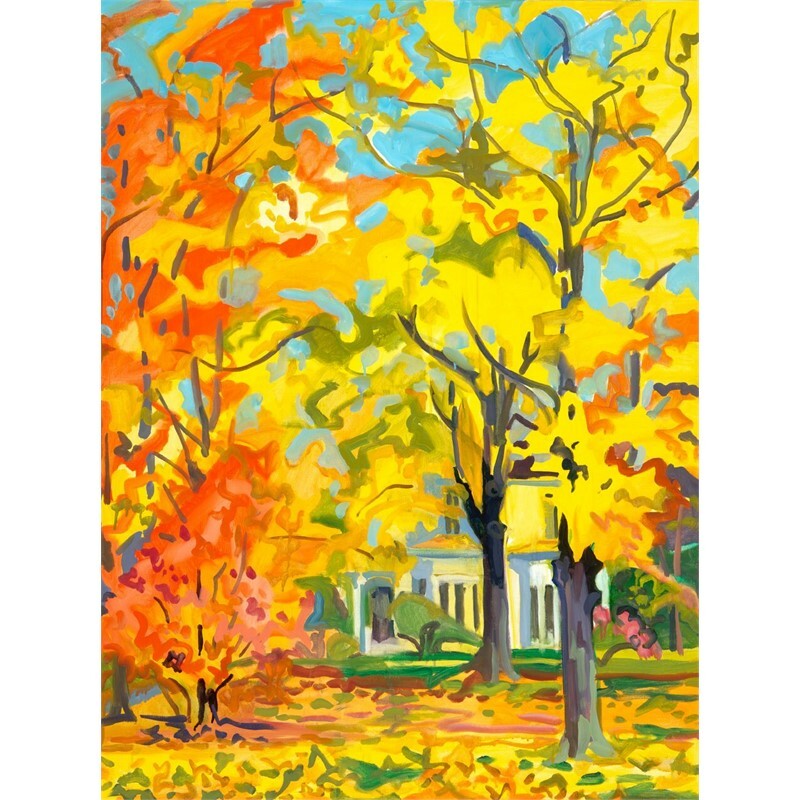 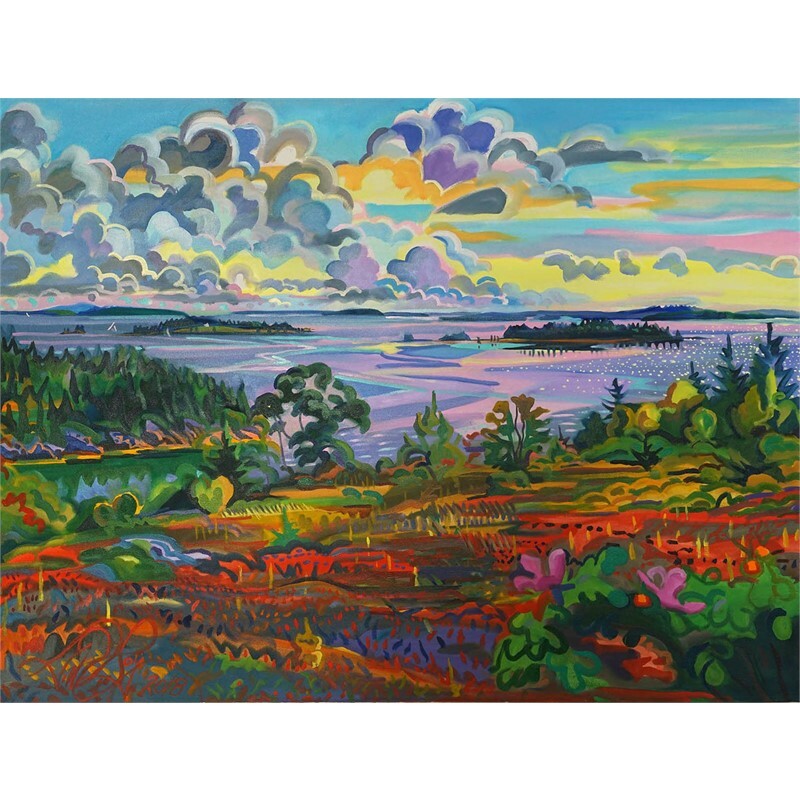 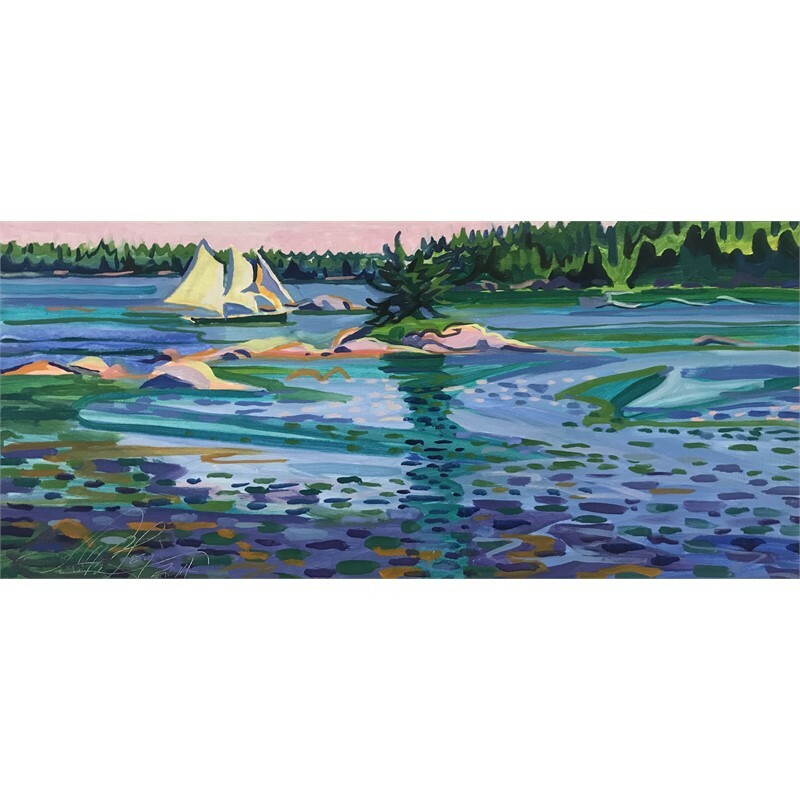 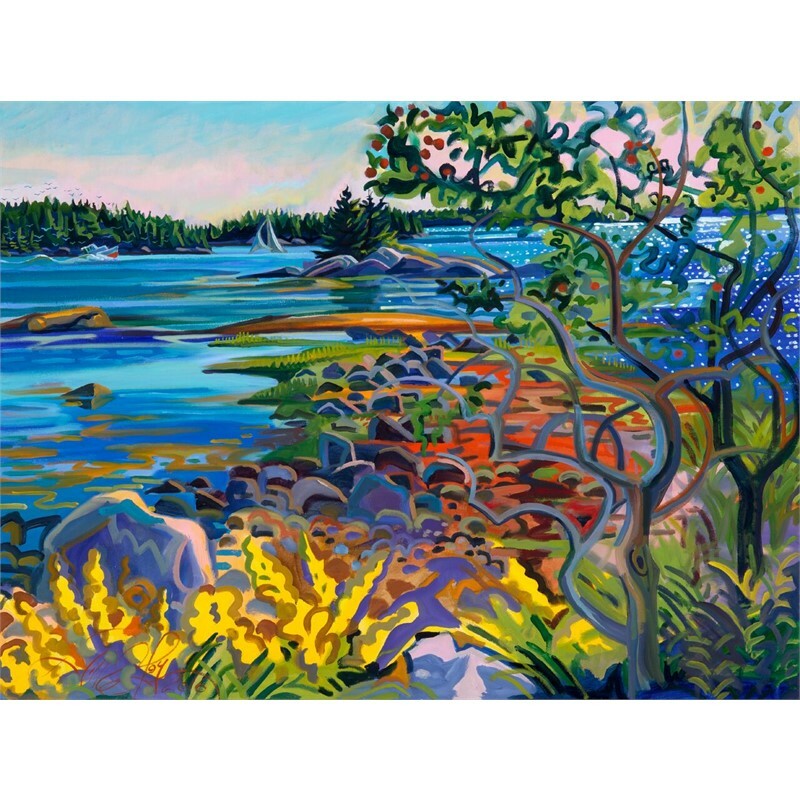 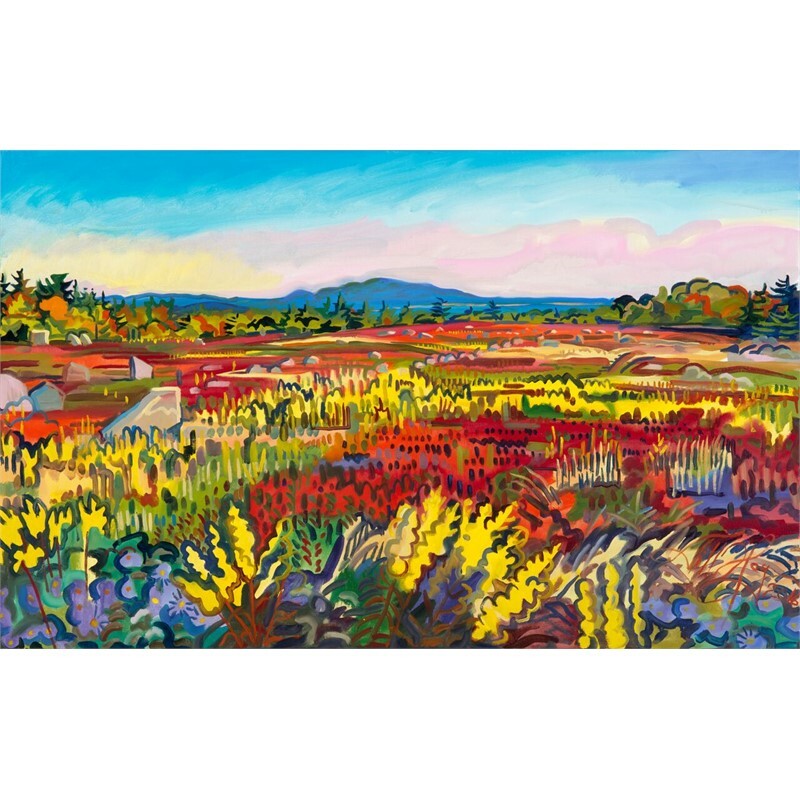 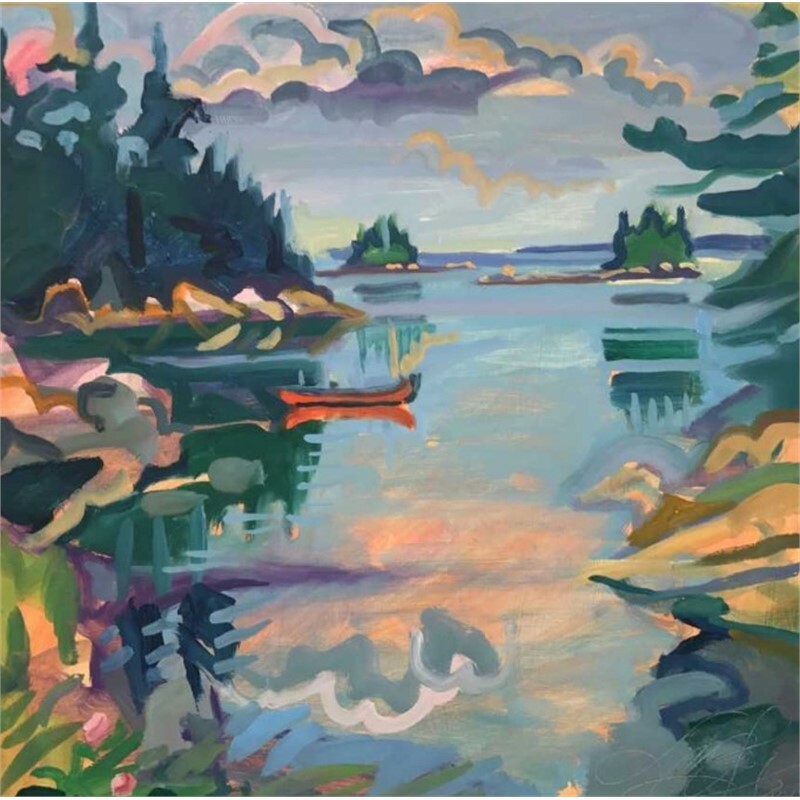 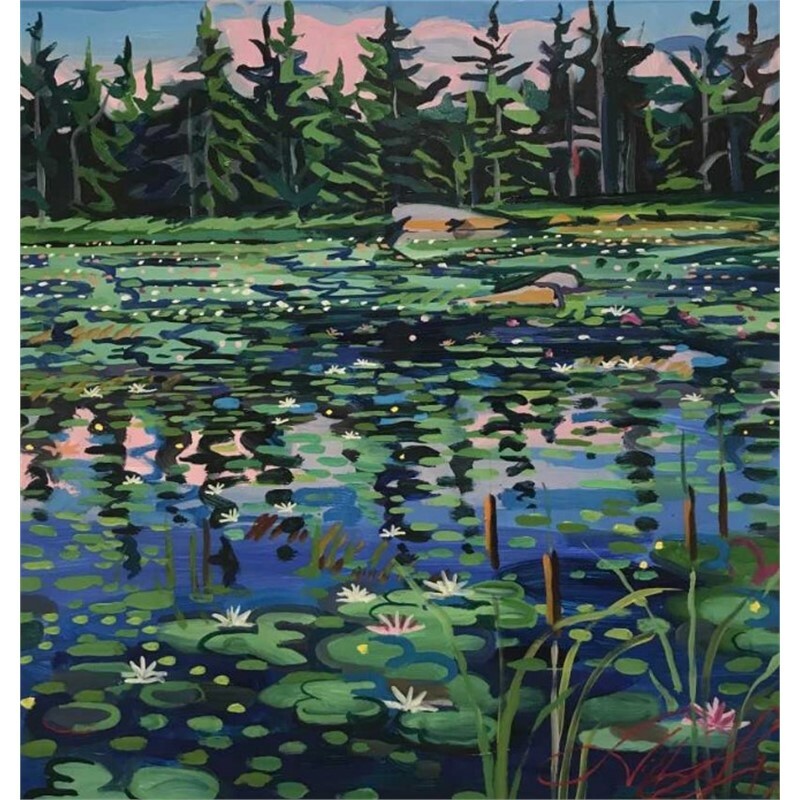 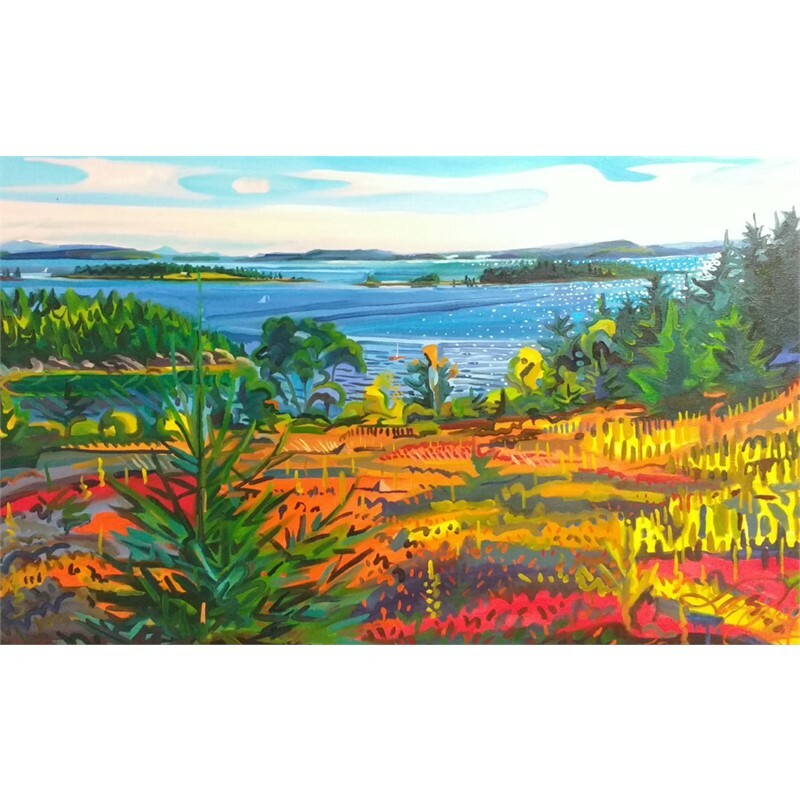 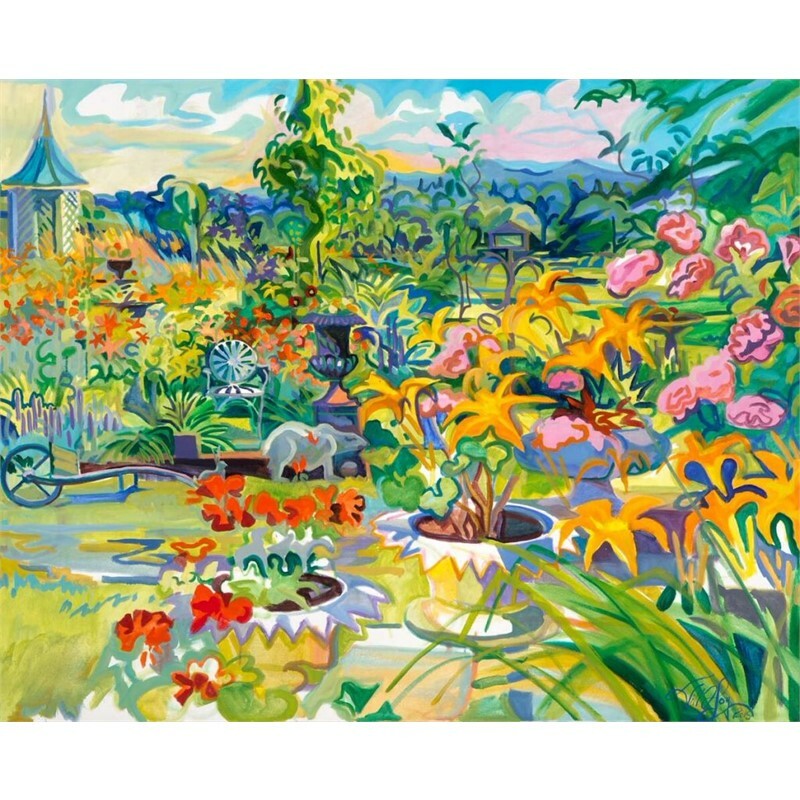 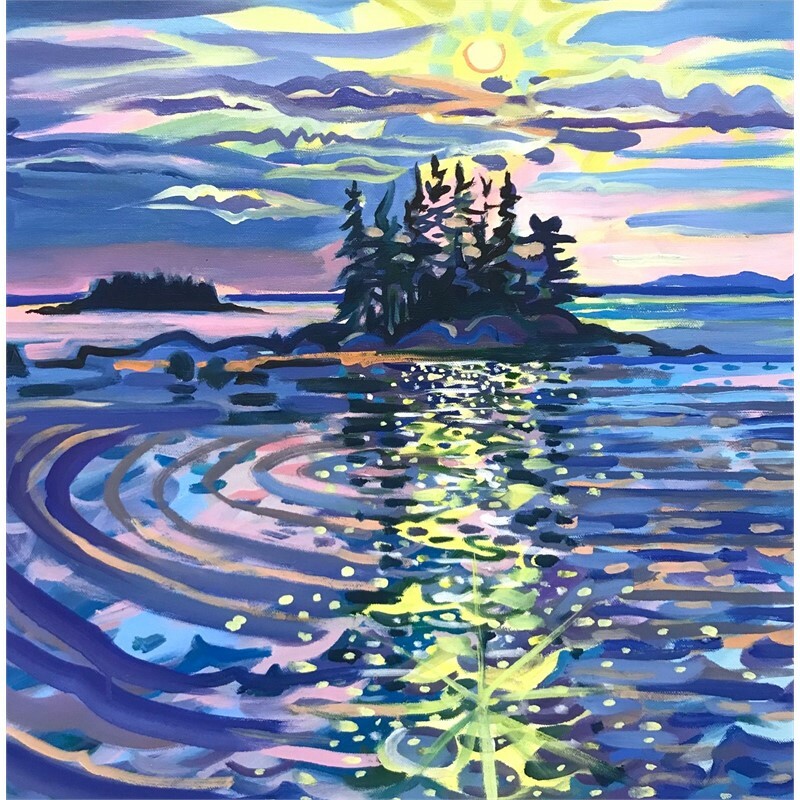 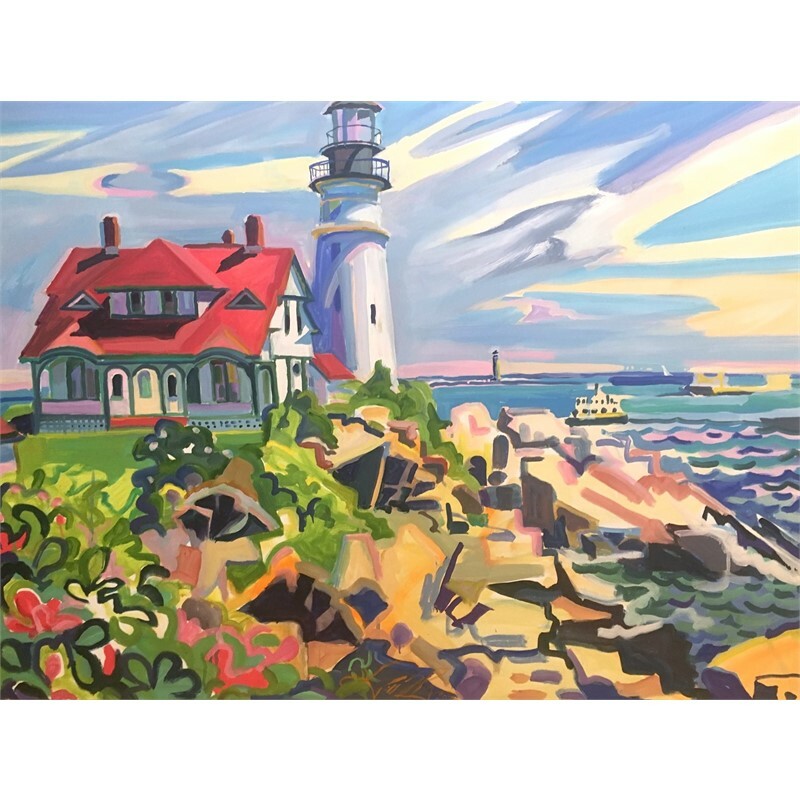 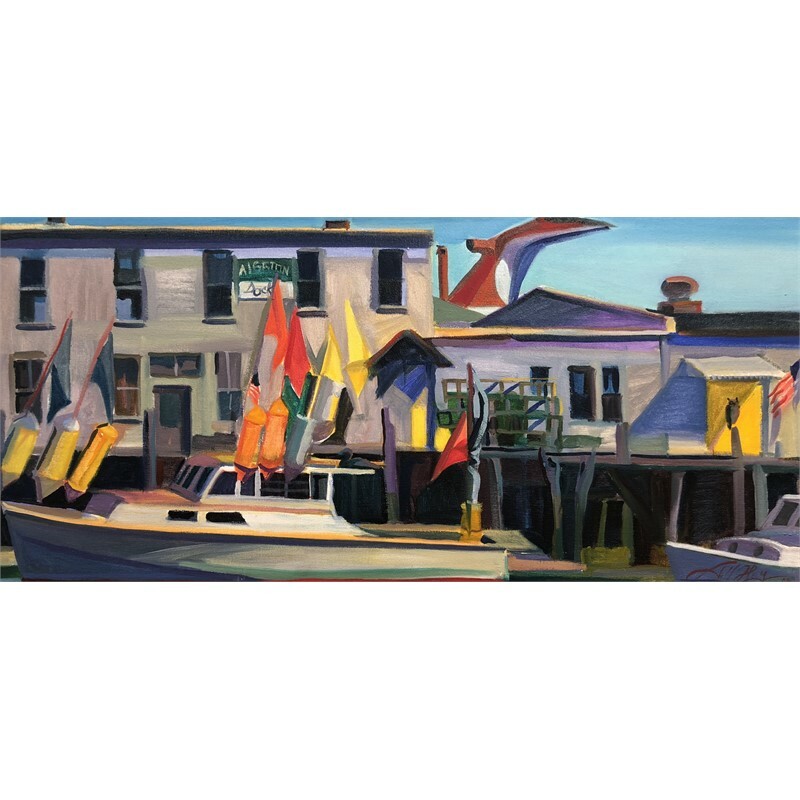 Her use of vivid color in the Maine paintings results in surfaces that are richly and intensely painted with images that seem to vibrate. 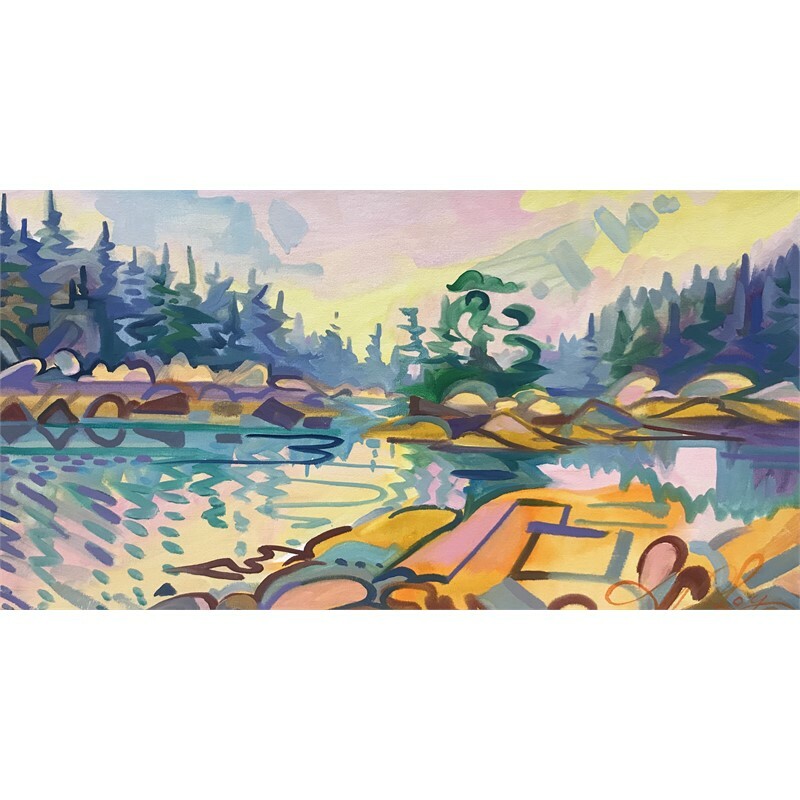 The artist considers the quality of light to be an important element in her work. 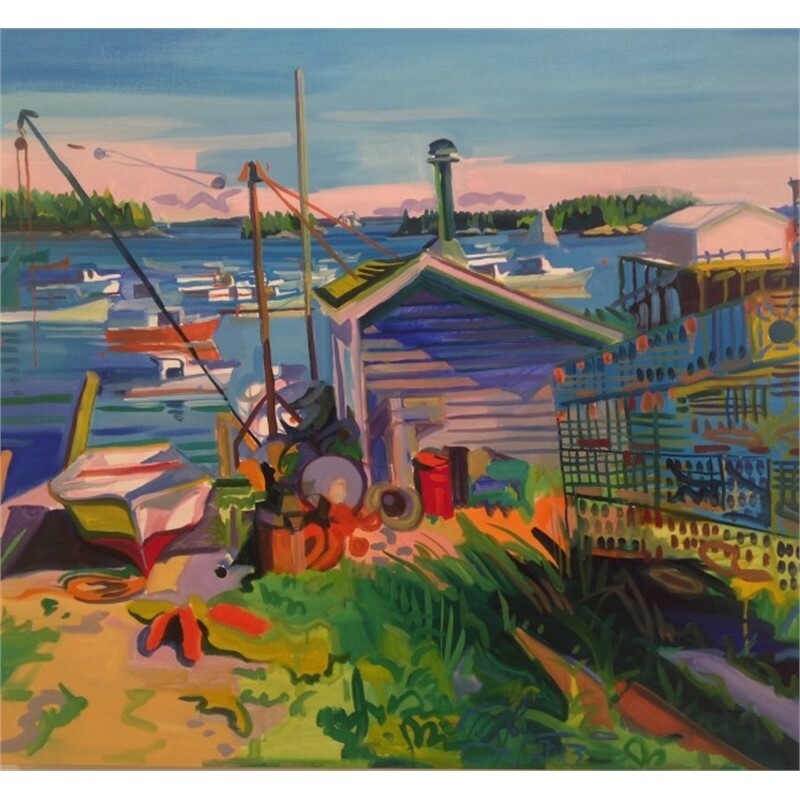 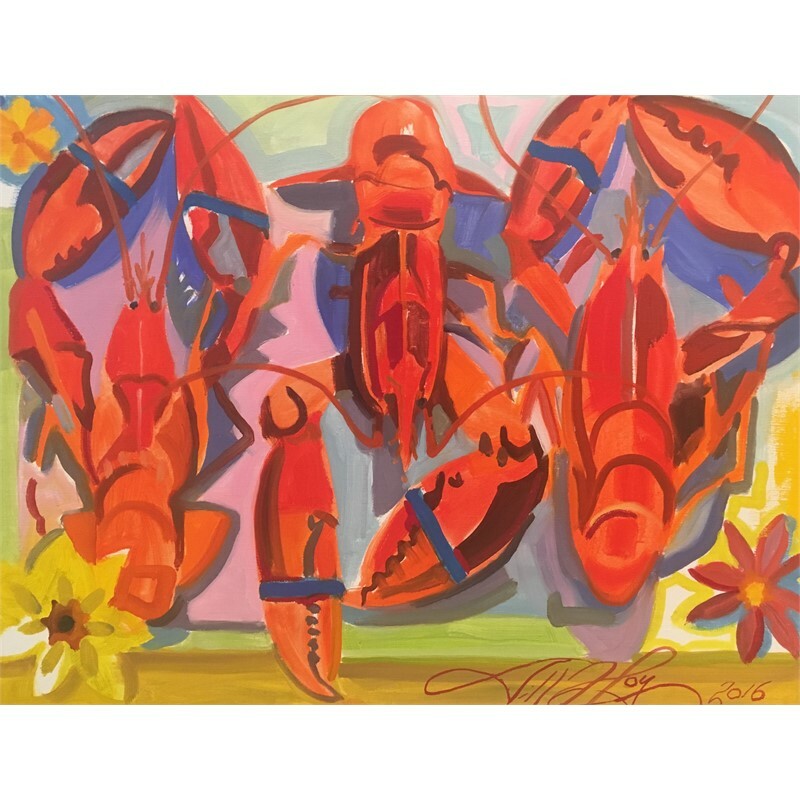 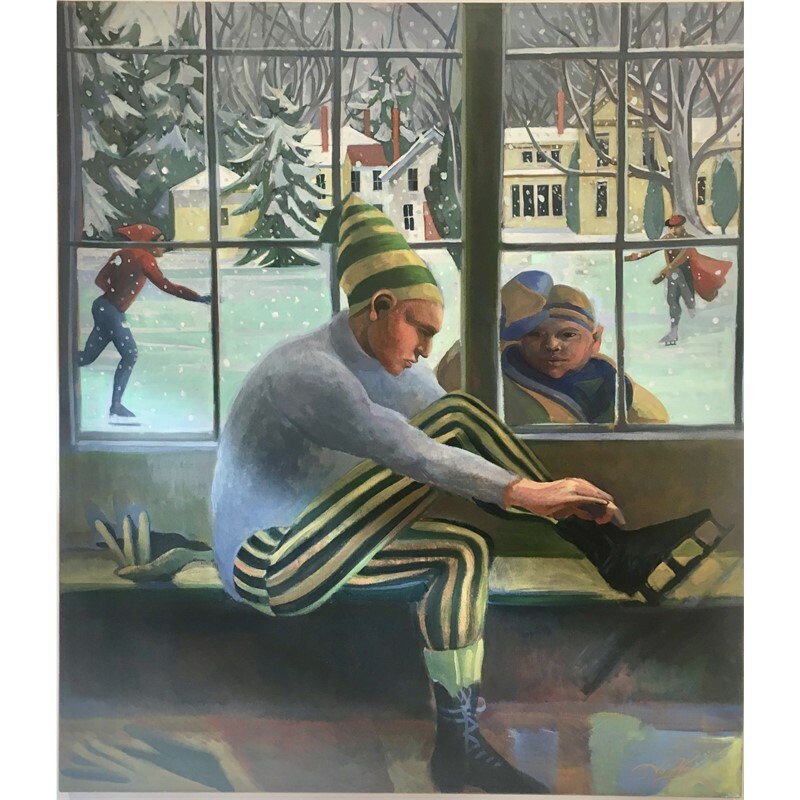 "The light in Maine is crystal slear, with a sharp-edged clarity and a gem-like quality. 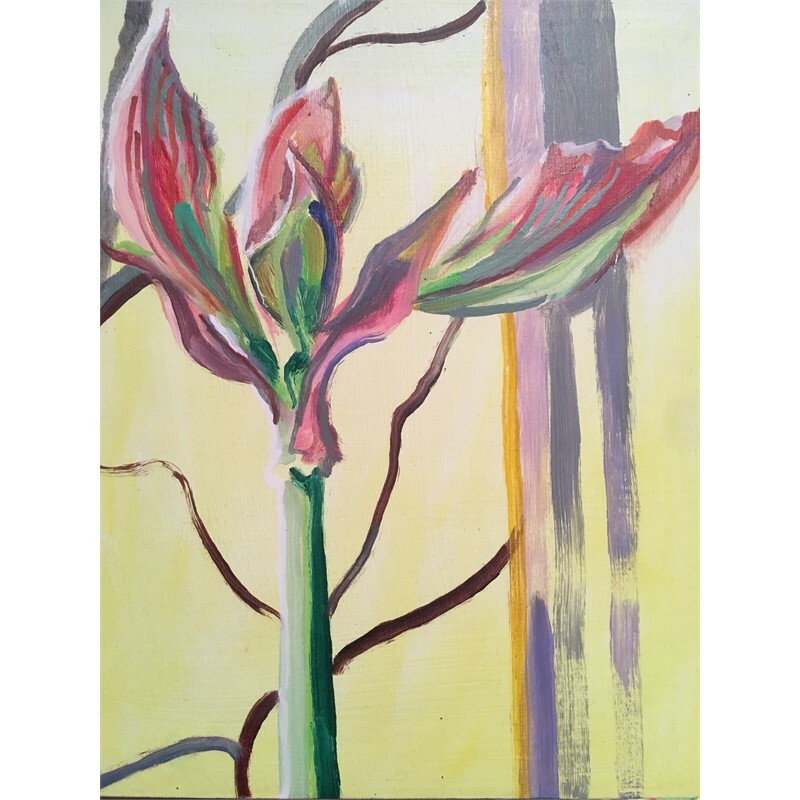 I often work in the morning or late afternoon when these qualities are especially strong." 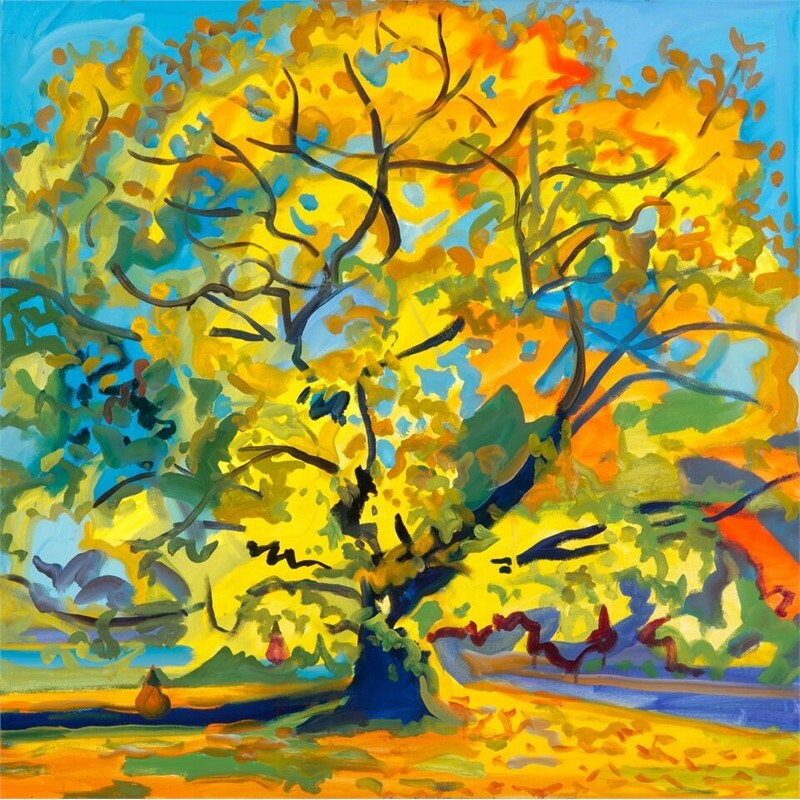 As a result, her paintings capture specifics of time and light. 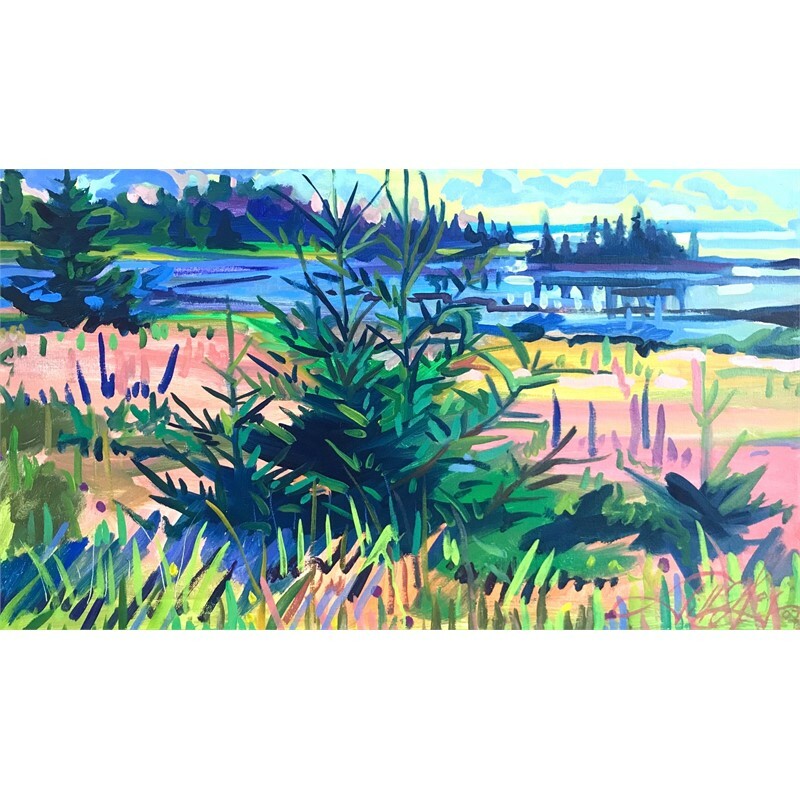 Because she's been a regular resident of the Deer Isle area since 1965, much of her work can be seen as a document of places and time in the area. 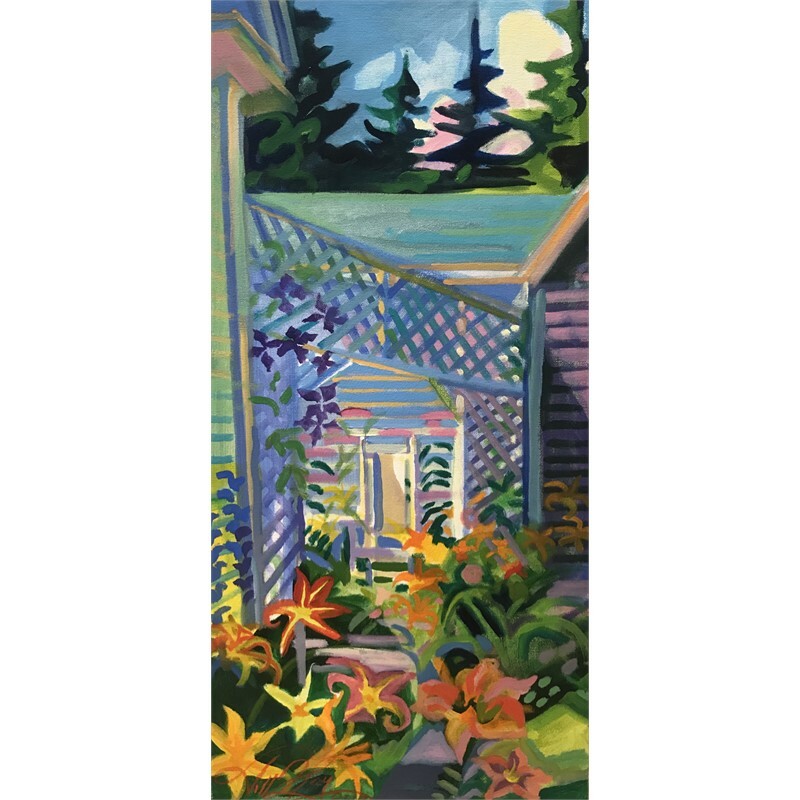 The paintings in the exhibition that were created in her Manhattan studio are primarily done from imagination, often inspired by the drawing books she has kept for many years. 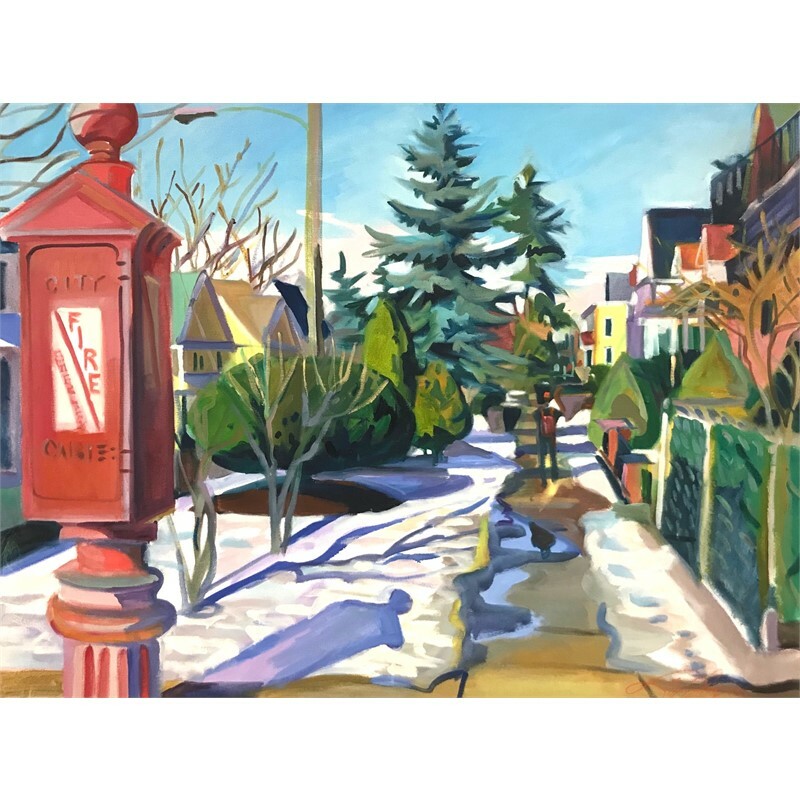 The works combine imagination with recollections of reality such as friends or moments witnessed in the unique experience of New York City. 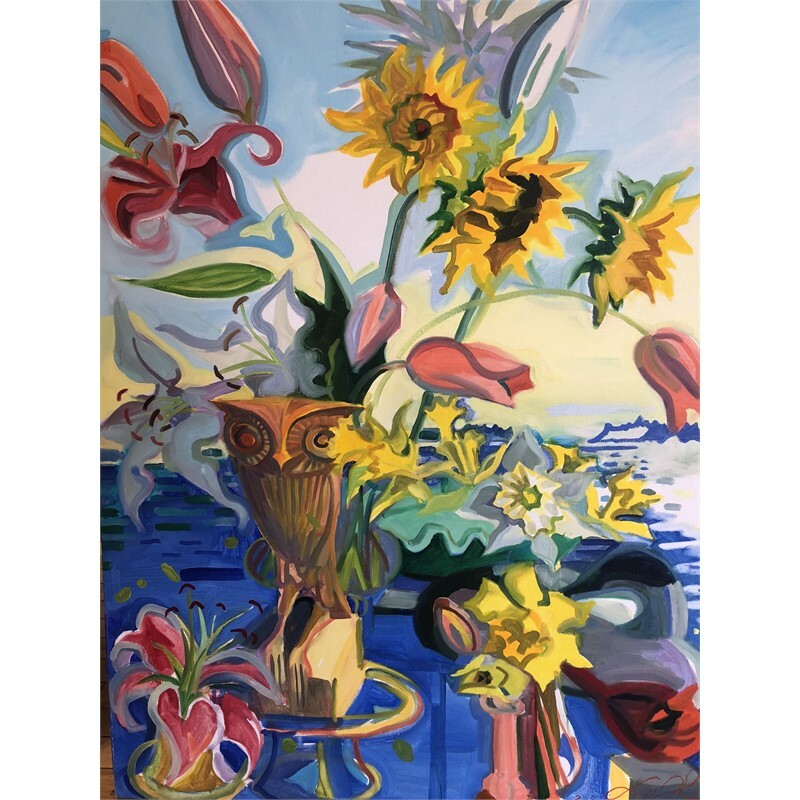 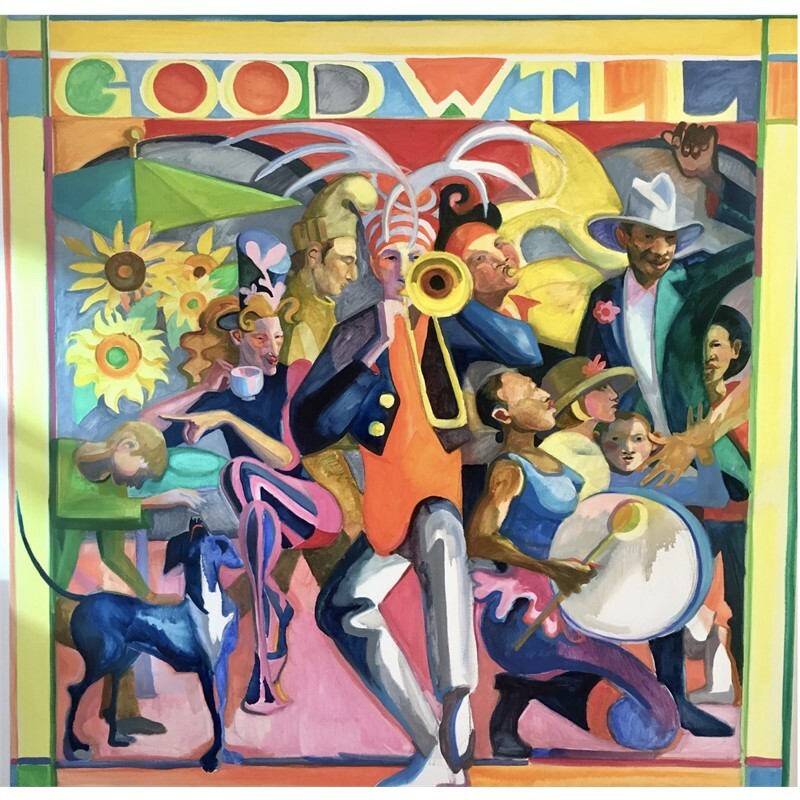 These paintings reflect the essence of New York, a place full of stimulus and energy, with imagery that is often symbolic, conflicting, and surreal. 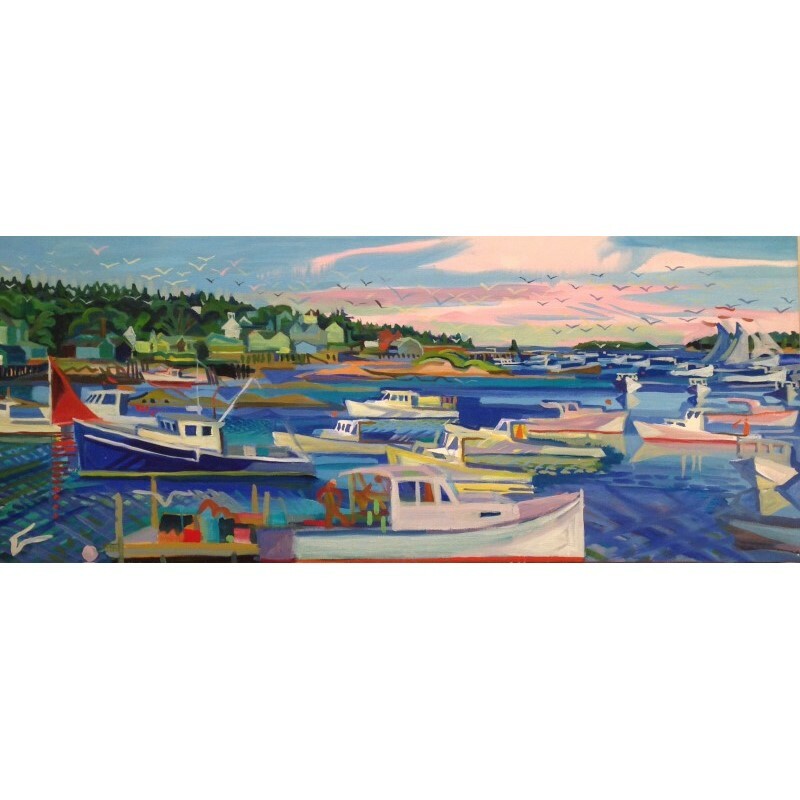 In comparing the two bodies of work the artist says, "The studio paintings are created between myself and the canvas. 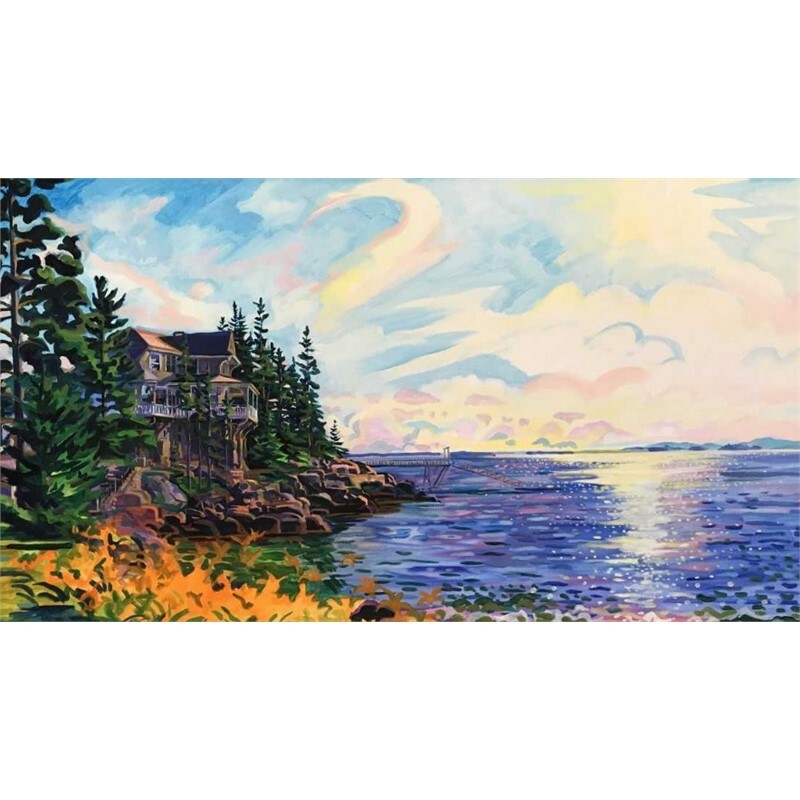 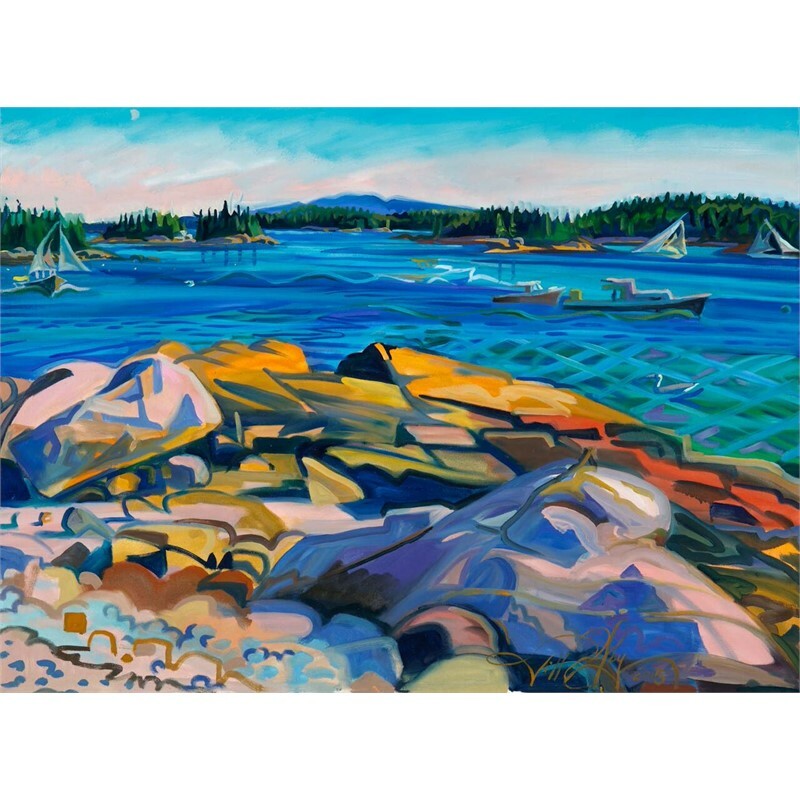 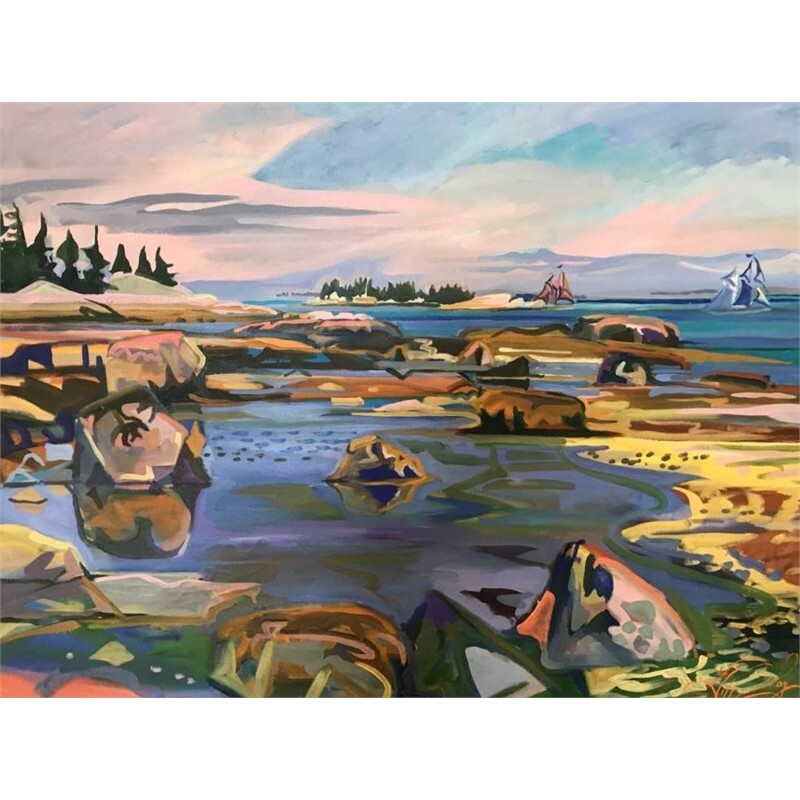 The Maine paintings are the result of myself, the canvas, and reality." 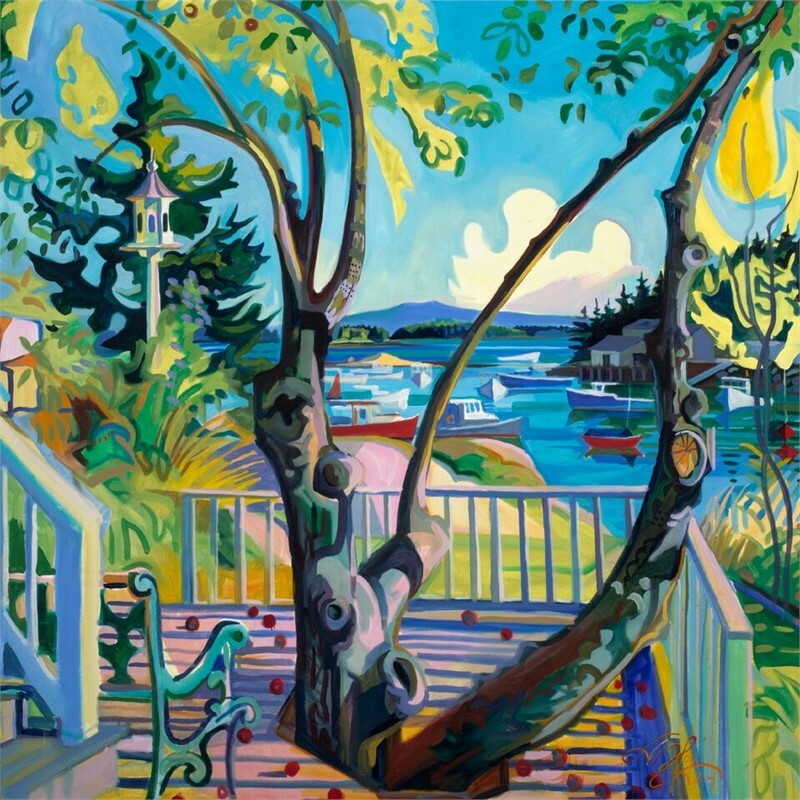 Jill Hoy earned a B.F.A. 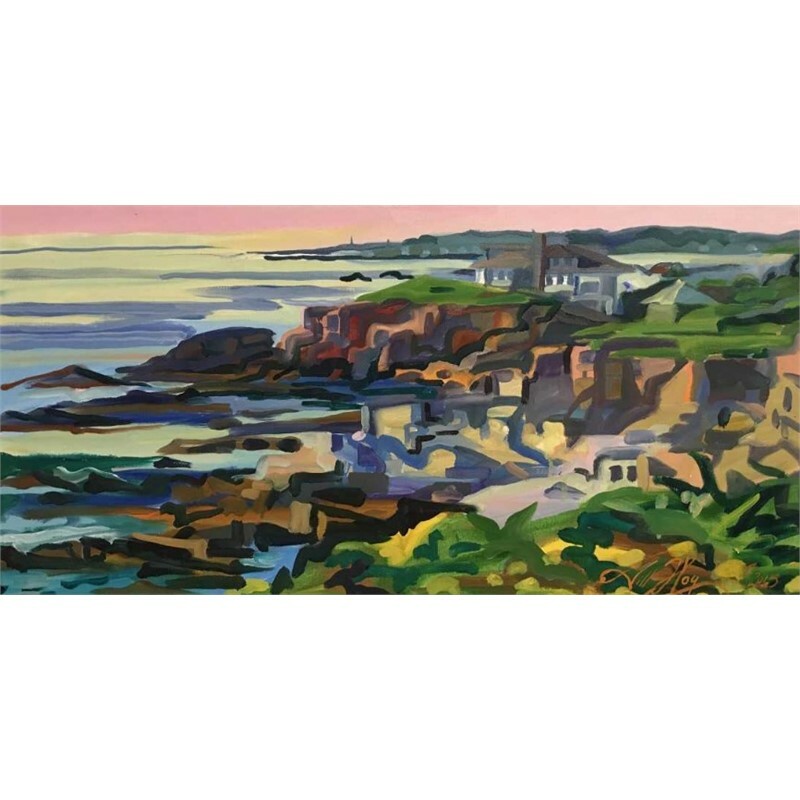 from the University of California at Santa Cruz and also attended the New York Academy of Art in New York City. 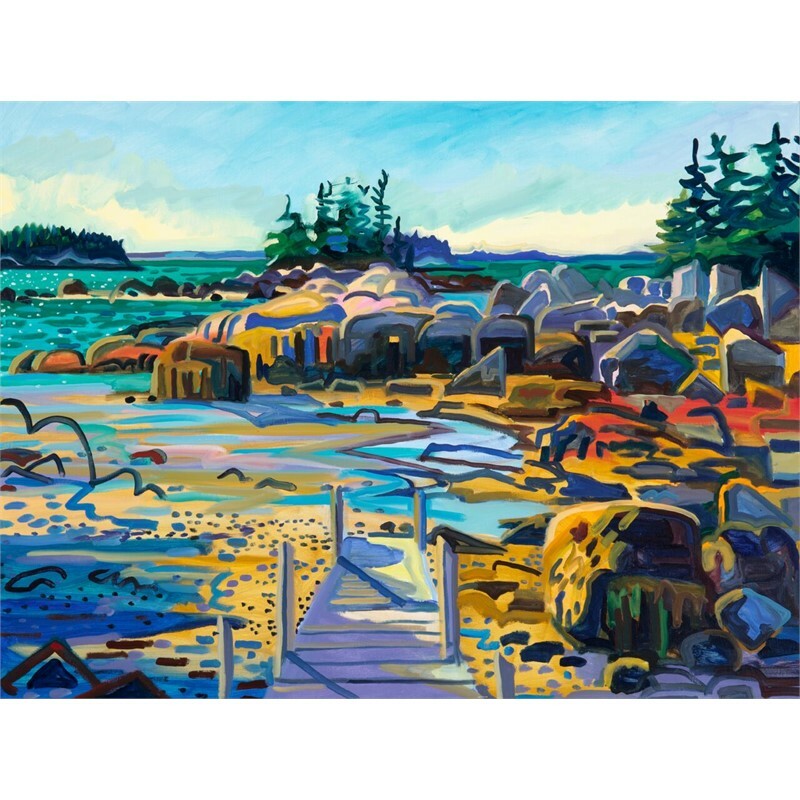 Her work has been included in numerous solo and group exhibitions around the country. 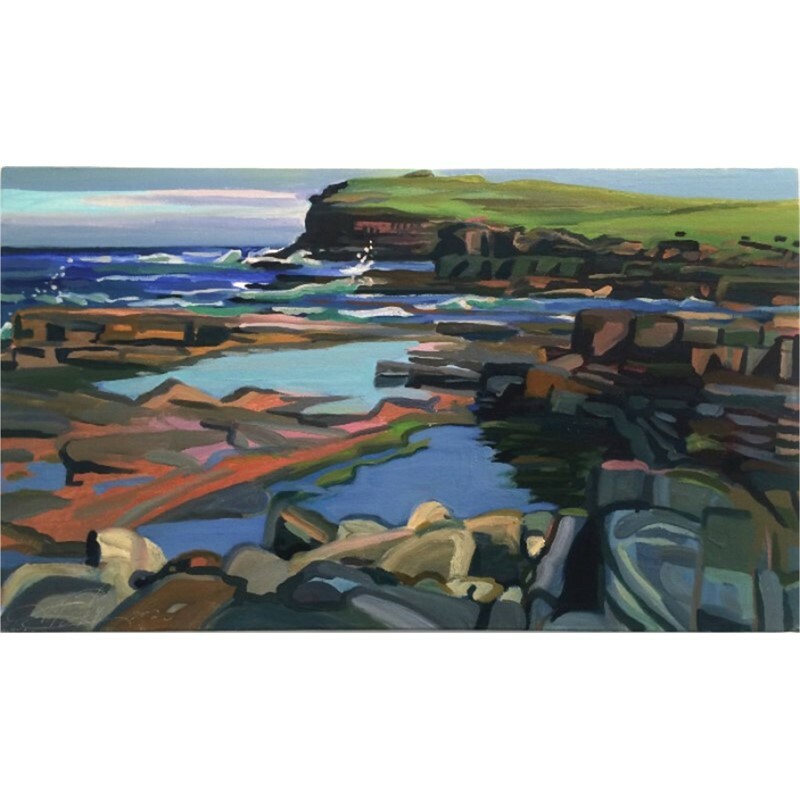 Jill creates two bodies of work, one which is figurative and created in her studio, reflecting her imagination; the other is a series of landscapes painted en plein air. 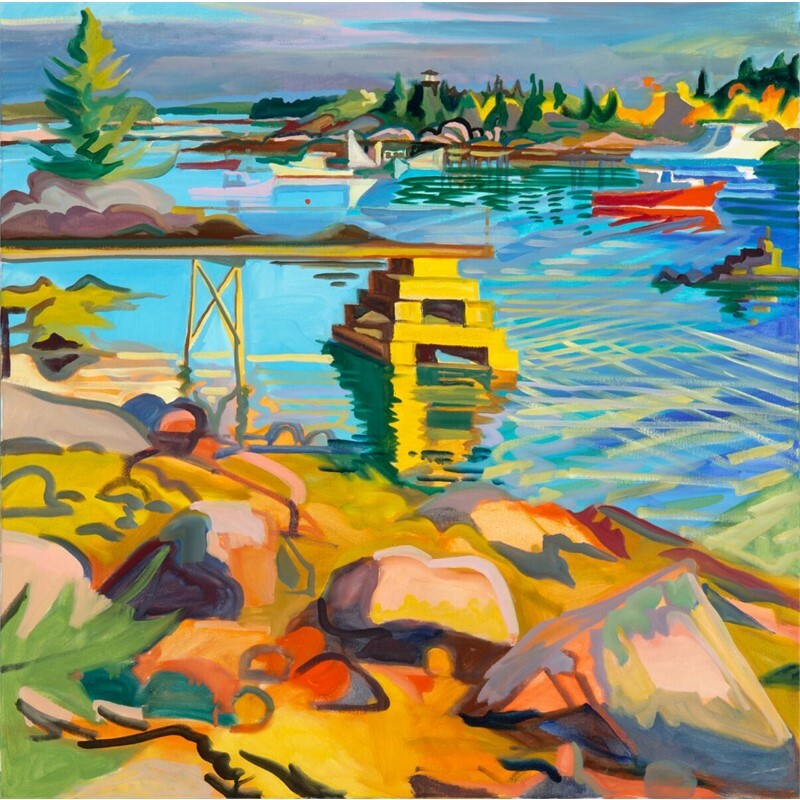 The artist divides her time among residences in Stonington, Maine, Somerville, Massachusetts, and New York City. 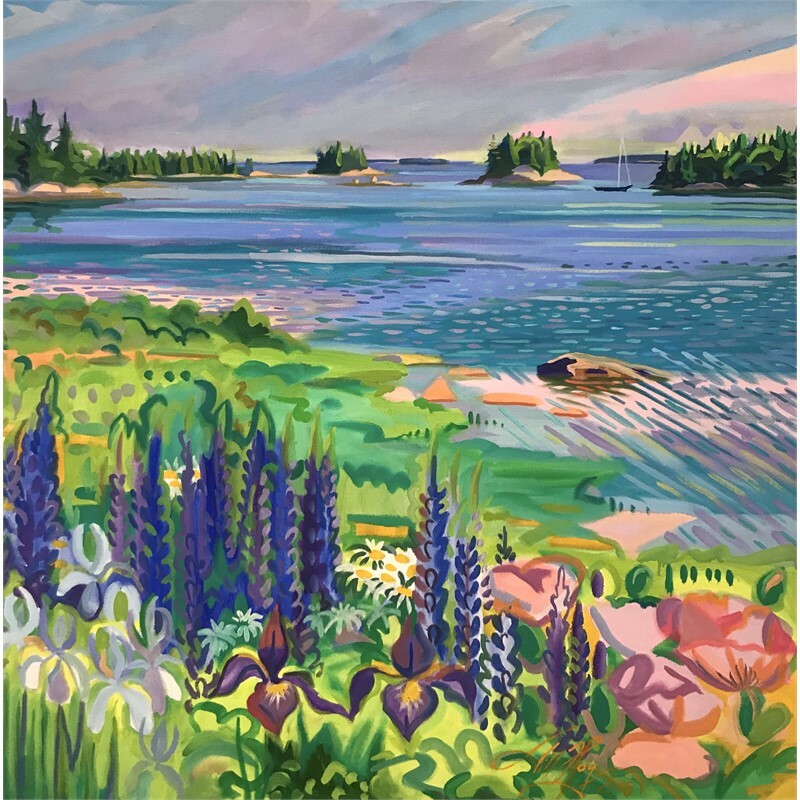 The work she creates in Maine is inspired by direct observation of the landscape and includes seascapes, architecture, and gardens. 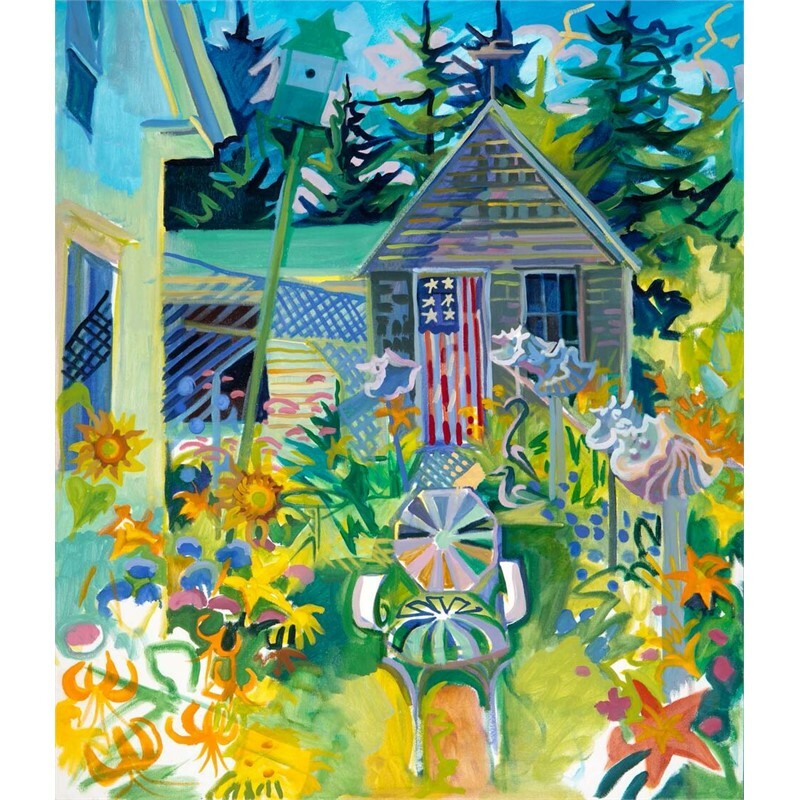 The artist, working on location, is especially interested in the effects of natural light, color, and pattern. 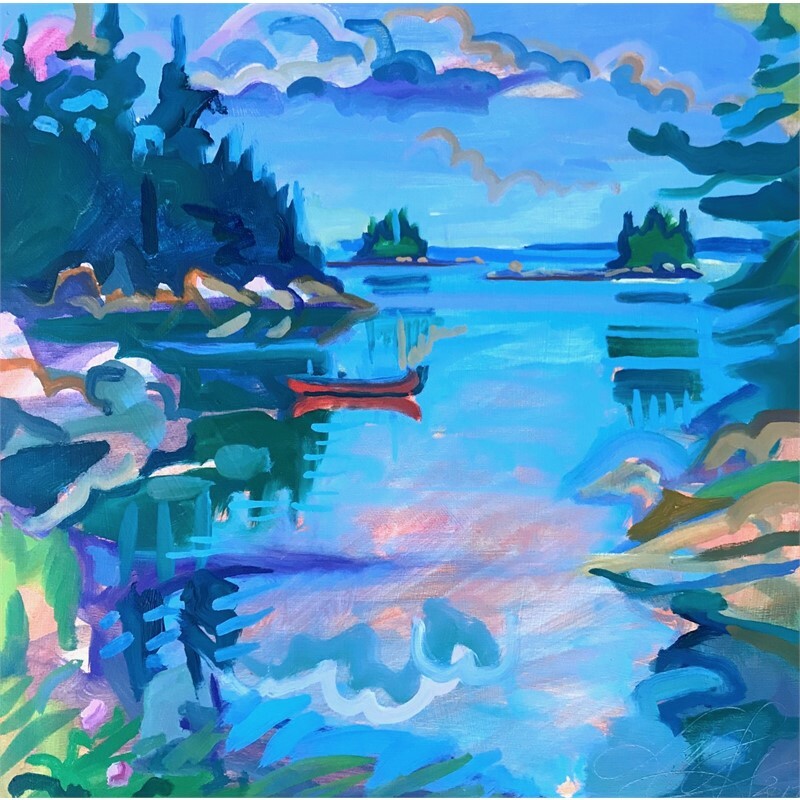 Her use of vivid color in the Maine paintings results in surfaces that are richly and intensely painted with images that seem to vibrate. 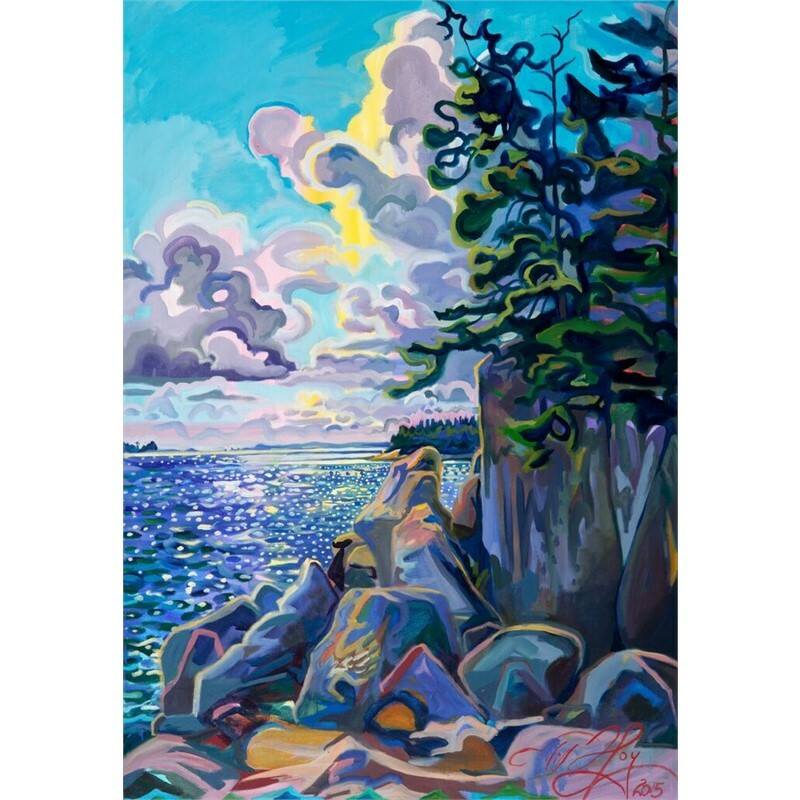 The artist considers the quality of light to be an important element in her work. 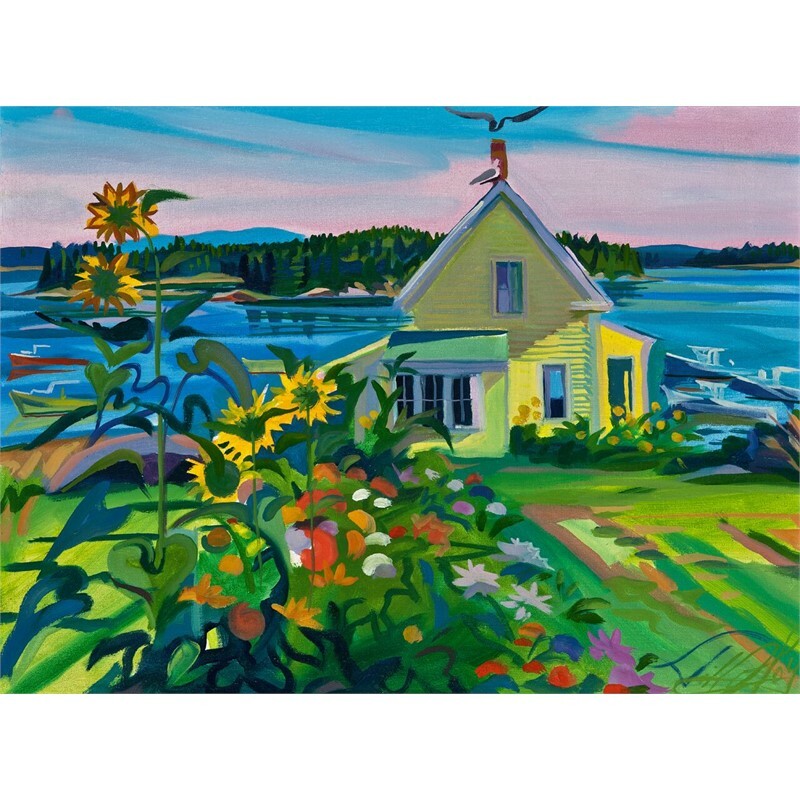 "The light in Maine is crystal slear, with a sharp-edged clarity and a gem-like quality. 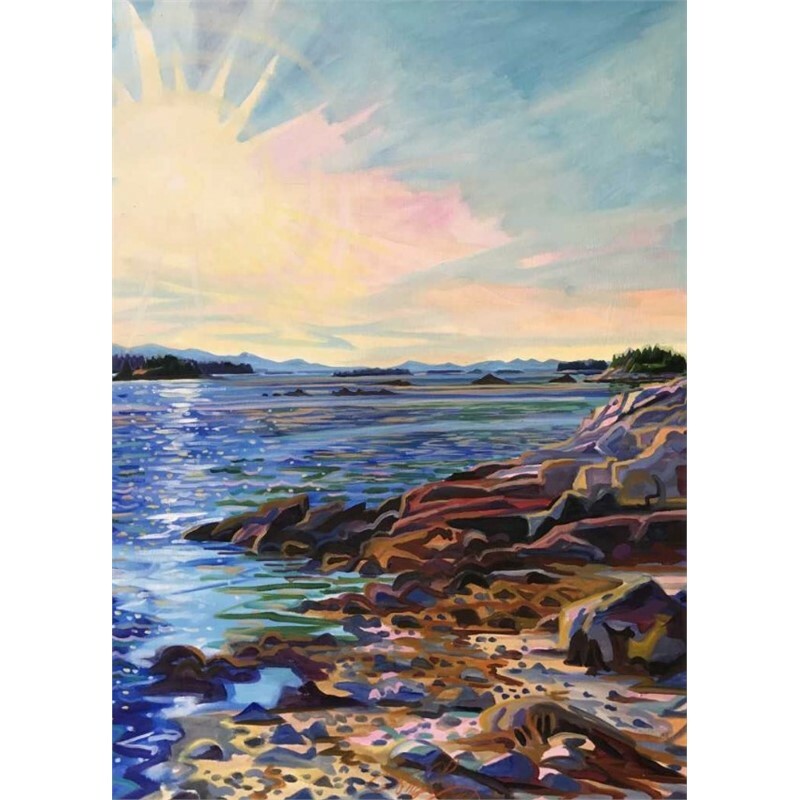 I often work in the morning or late afternoon when these qualities are especially strong." 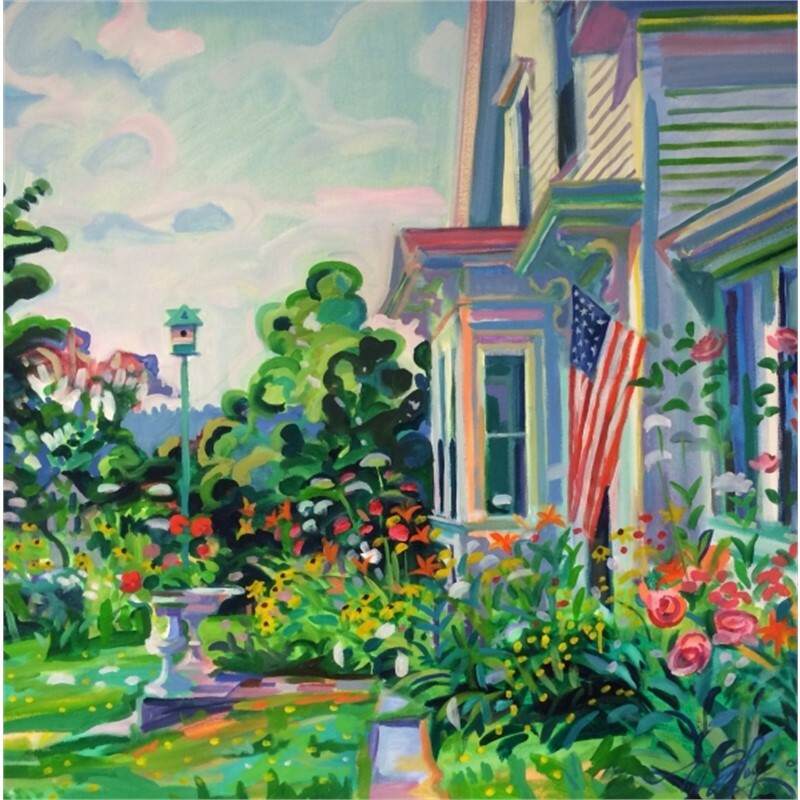 As a result, her paintings capture specifics of time and light. 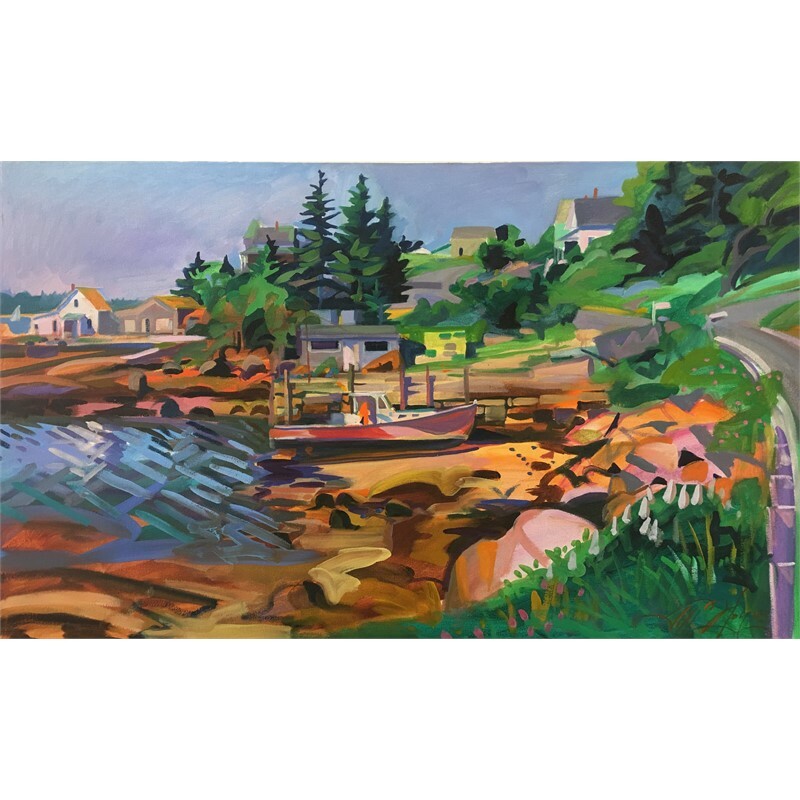 Because she's been a regular resident of the Deer Isle area since 1965, much of her work can be seen as a document of places and time in the area. 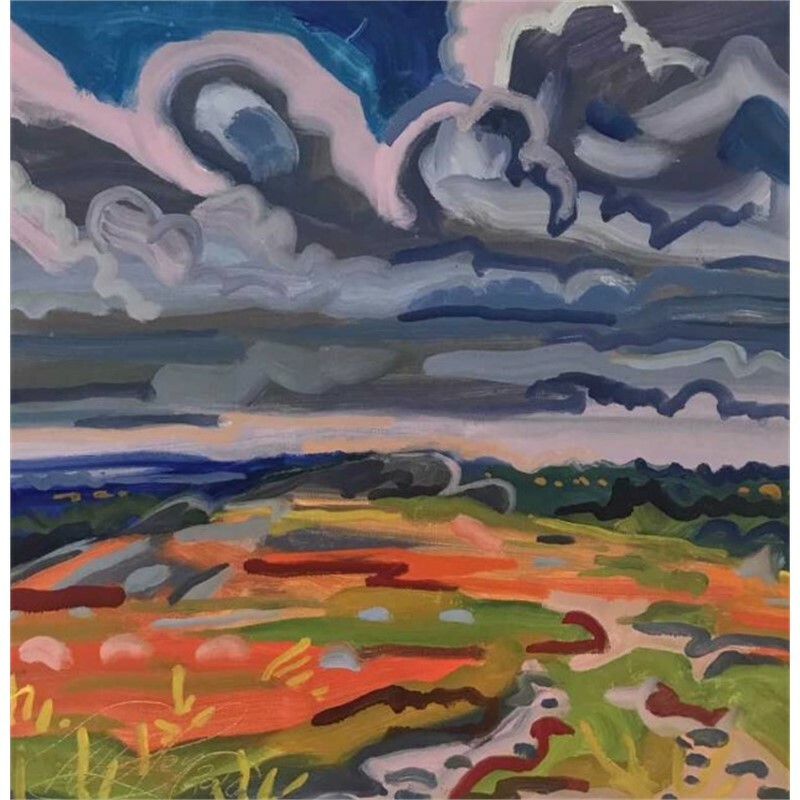 The paintings in the exhibition that were created in her Manhattan studio are primarily done from imagination, often inspired by the drawing books she has kept for many years. 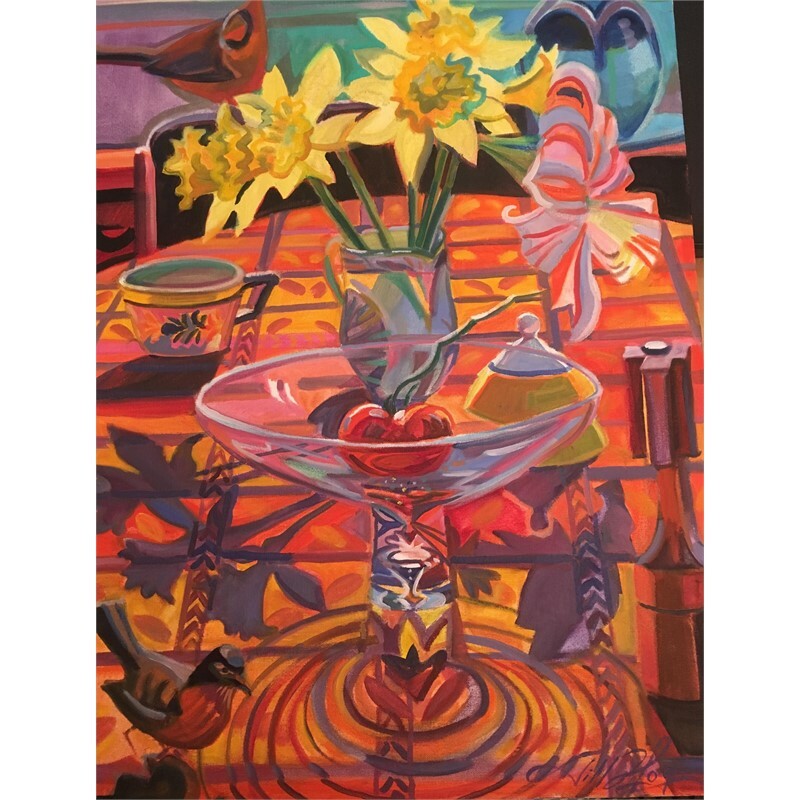 The works combine imagination with recollections of reality such as friends or moments witnessed in the unique experience of New York City. 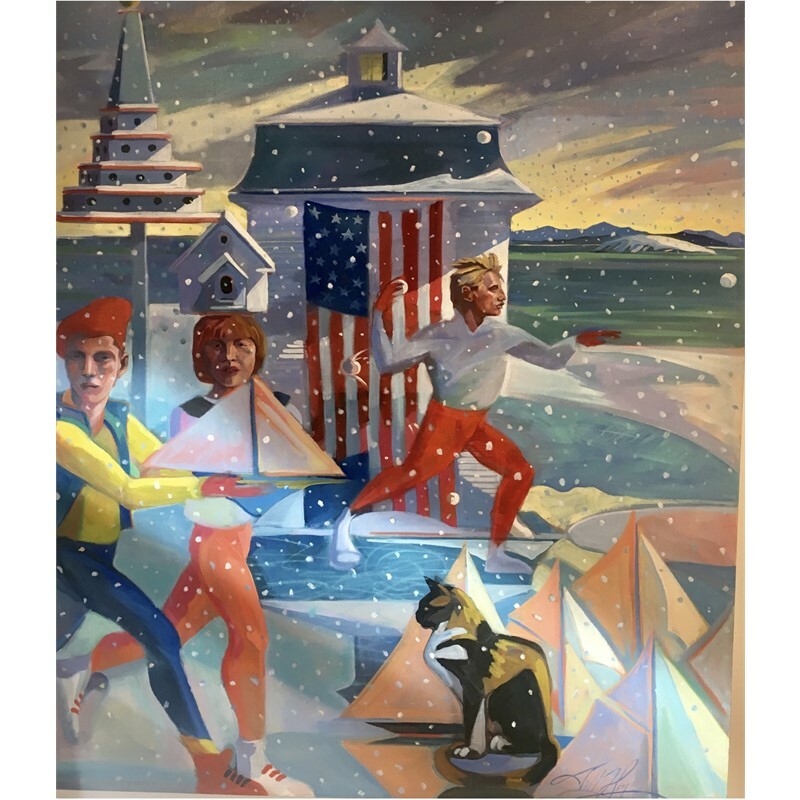 These paintings reflect the essence of New York, a place full of stimulus and energy, with imagery that is often symbolic, conflicting, and surreal. 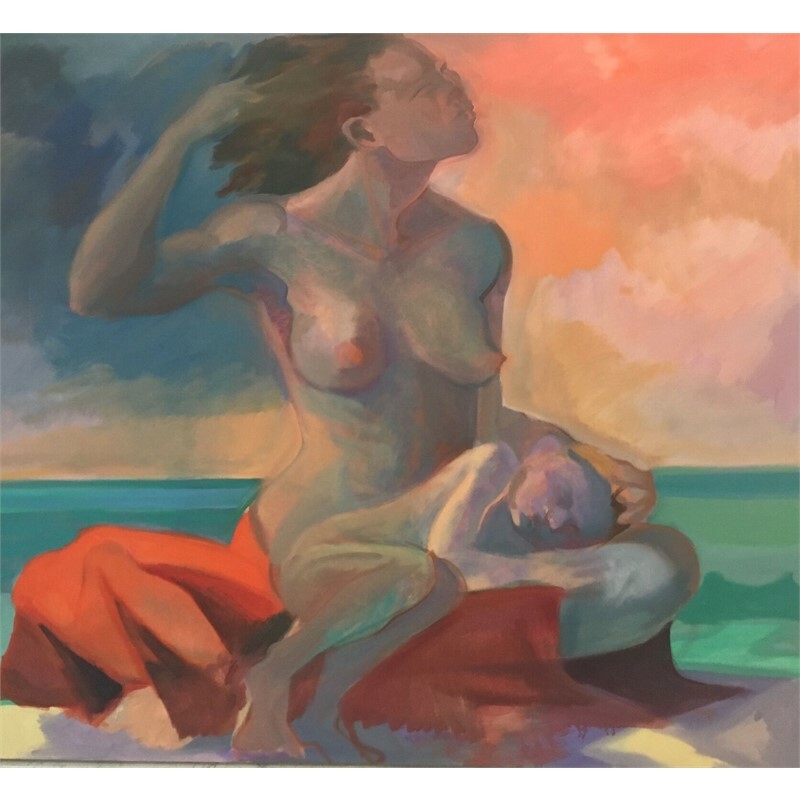 In comparing the two bodies of work the artist says, "The studio paintings are created between myself and the canvas. 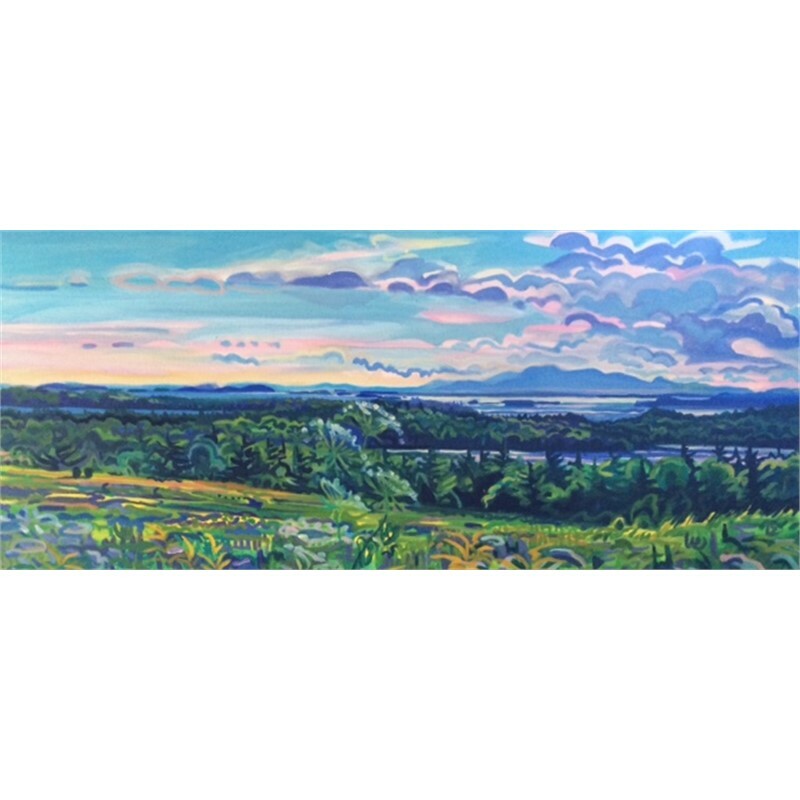 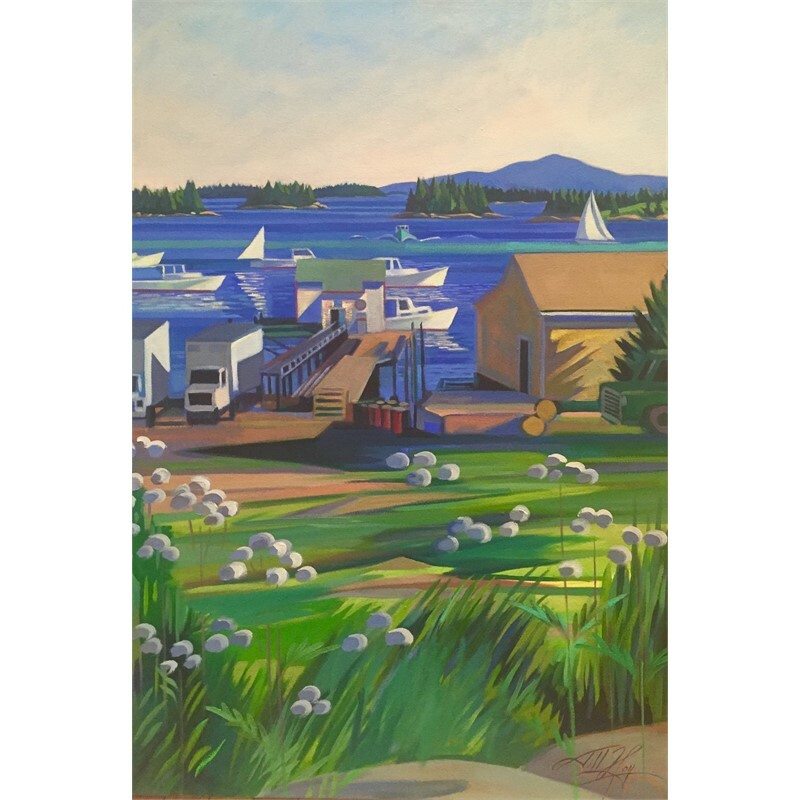 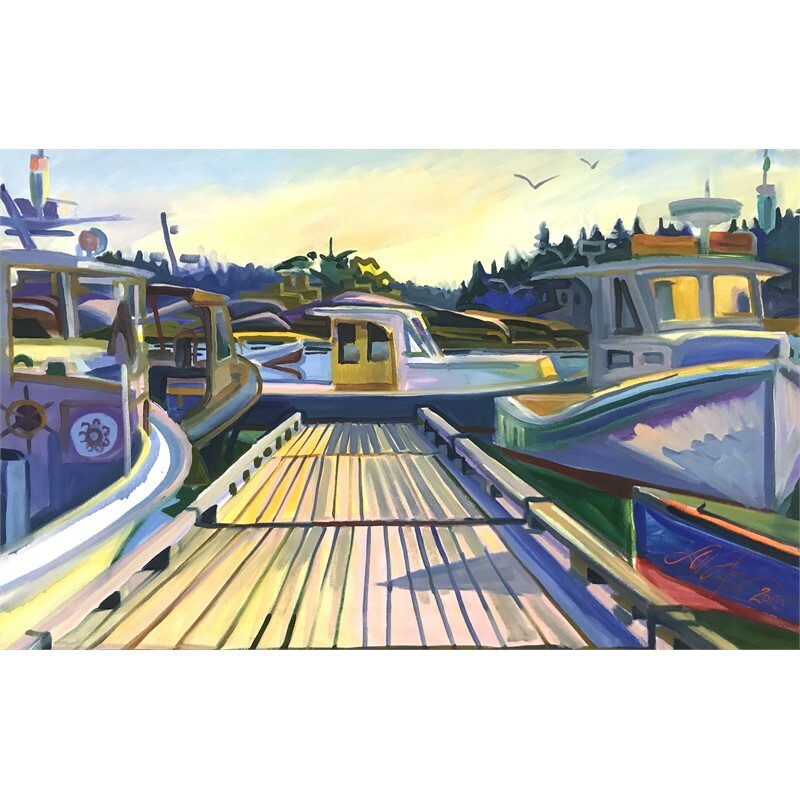 The Maine paintings are the result of myself, the canvas, and reality."